Posted: August 5, 2018 in Fotos, Obscurities, Who,What,Where & When...? 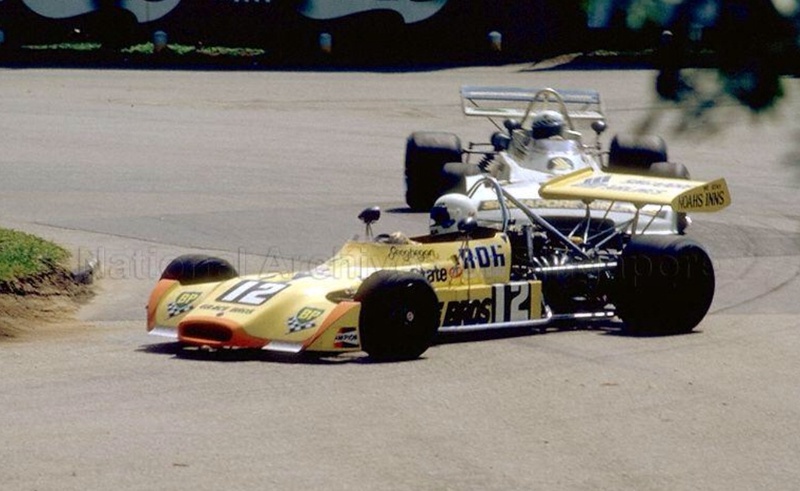 No standing on ceremony here, although its a you-beaut ANF1 car- the Formula 5000 machine is travelling in no more comfort than my Formula Vee and considerably less so than my old Lola T342 Formula Ford. And its off to Surfers Paradise, 850 kilometres away in the hands of Ian Douglass to whom it has just been sold. 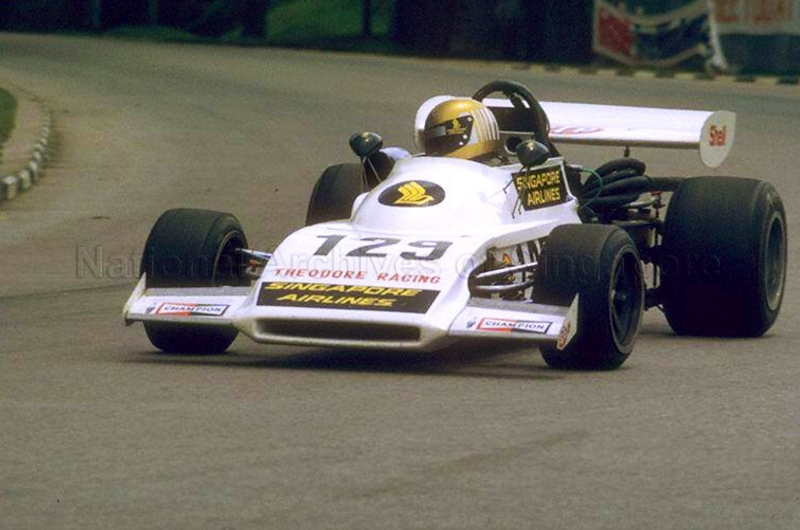 In many ways this little baby would be ‘the’ F5000 Matich to own. 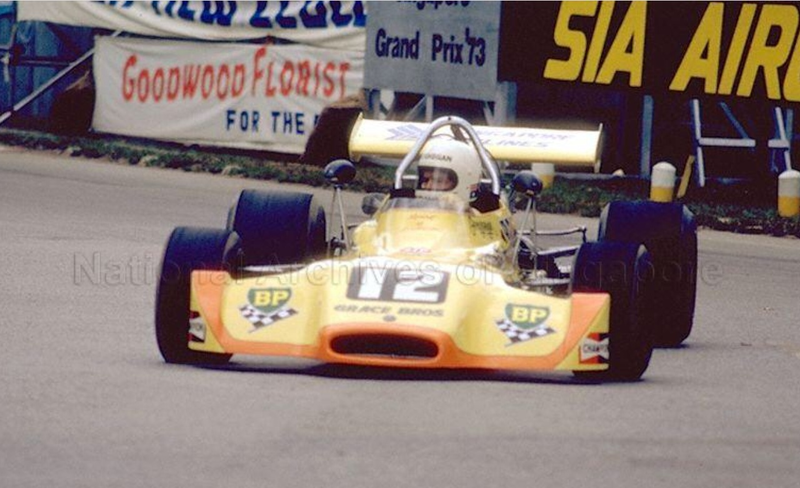 It toured the US, was raced by Lella Lombardi at Sandown and Oran Park in 1974, and, sold to John Goss to keep A53 ‘007’ company, won the 1976 Sandown Park Australian Grand Prix modified to A53 spec. 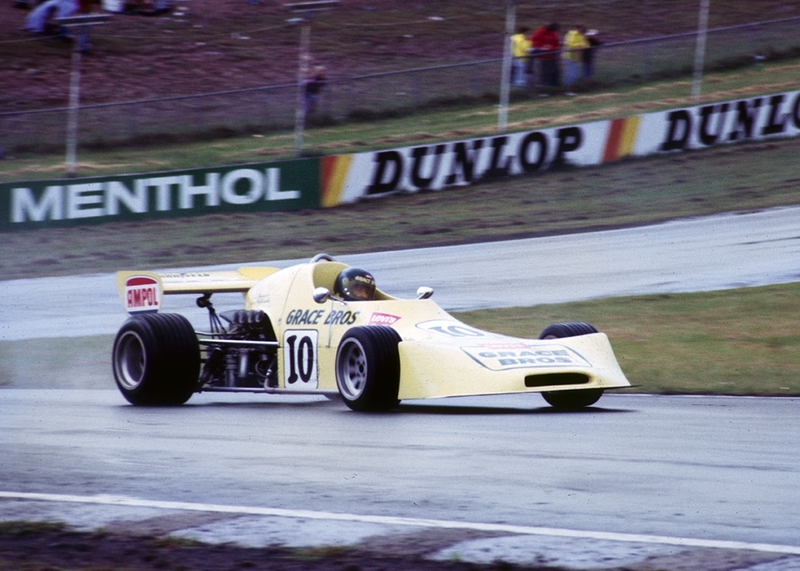 Later still French sportscar ace Henri Pescarolo raced it at Calder in 1977, so too did Jim Richards in its ‘period dotage’ in 1979. 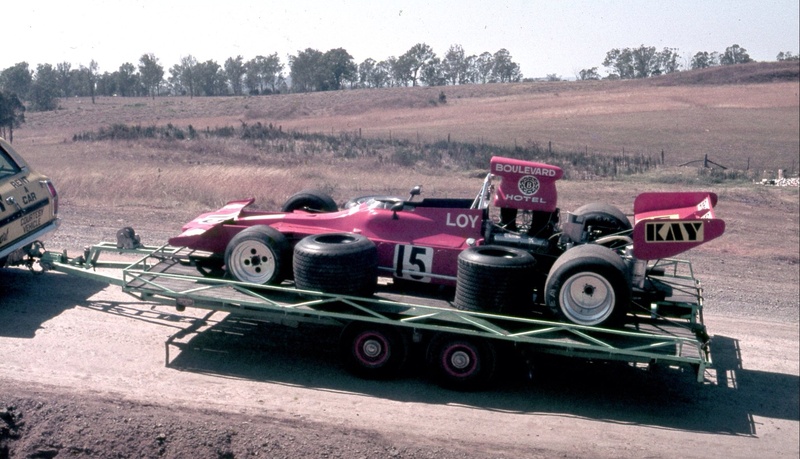 A very nice jigger indeed, here looking a bit forlorn on an open trailer behind an XA Ford Falcon Wagon rent-a-rocket. It could only be Australia with that backdrop? 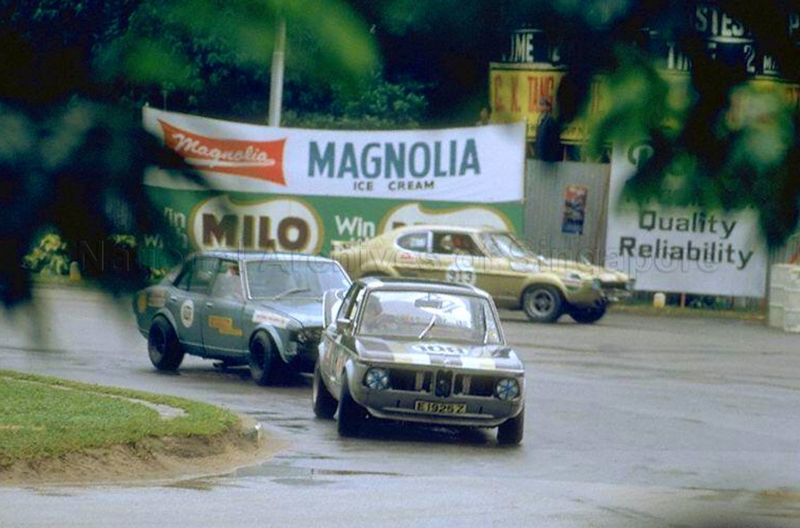 Love Don Elliott’s transporter providing the spectator vantage point, devoid of Ford Mustang it makes a mighty fine mini-grandstand. Jaguar Mk1, stark eucalypt tree and the topography of the northern Tasmanian midlands circuit. The cars are well known too, albeit Hamilton is about to lap the other two cars. 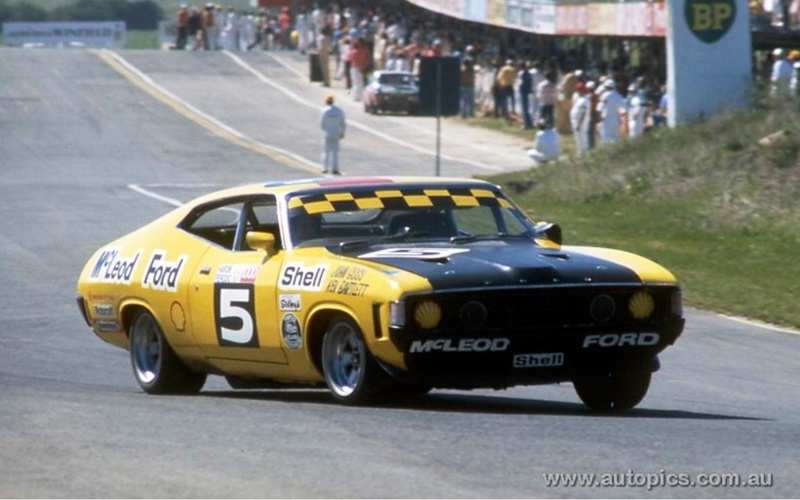 Oh, and the drivers are prominent too, Goss and Hamilton Australian Champions- in Ambrose’ case perhaps he is known as much as the father of touring car ace Marcos Ambrose and ‘co-father’ with Ralph Firman of Van Diemen racing cars. No prizes for guessing who suggested the name of that great marque. 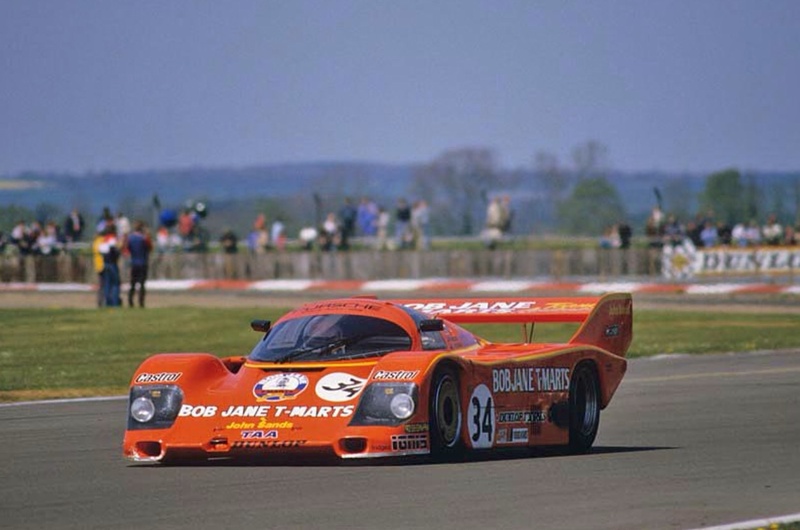 I’ve written articles about the John Goss built Tornado, Hamilton’s 906 and tangentially about Ross Ambrose’s car which started life as the Bob Britton built – he of Rennmax fame- Mildren Maserati sportscar driven by Ralph Sach, Frank Gardner and Kevin Bartlett. It then morphed into the ‘Rennmax Climax’. 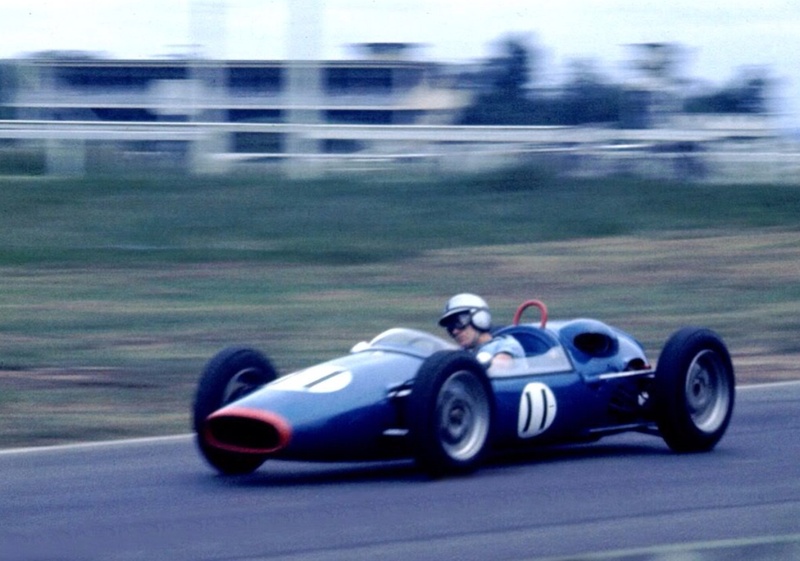 When sold by Alec Mildren to Ross Ambrose he fitted a Coventry Climax 2.2 litre four cylinder FPF engine in place of the Maserati Birdcage T61 motor which blew big-time whilst driven by Frank Gardner in the 1965 Australian Tourist Trophy at Lakeside, the chassis was re-named by Ross with Alecs consent. 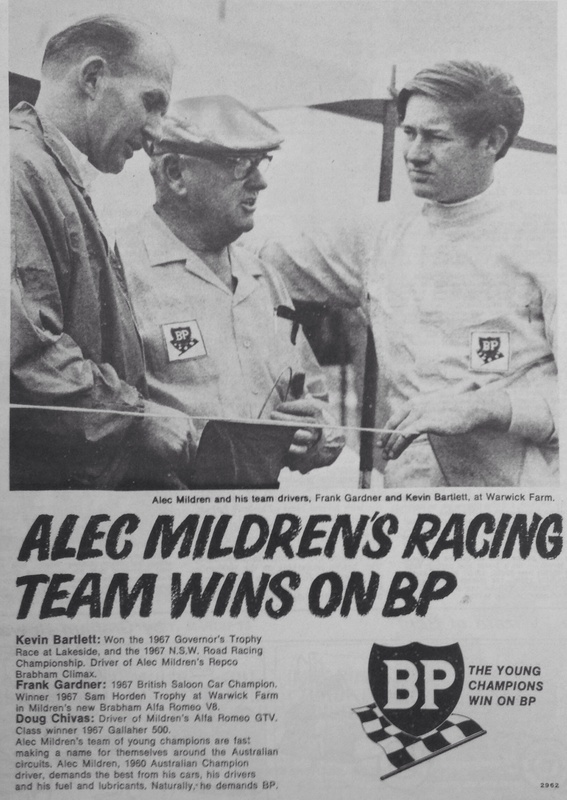 This article was inspired by David Keep’s opening shot, it was only when I sought Rob Barthlomaeus’ help with a race report that he pointed out this was a tragic meeting as one of the contestants, Melbourne’s Wally Mitchell later died as a result of a collision in this event. 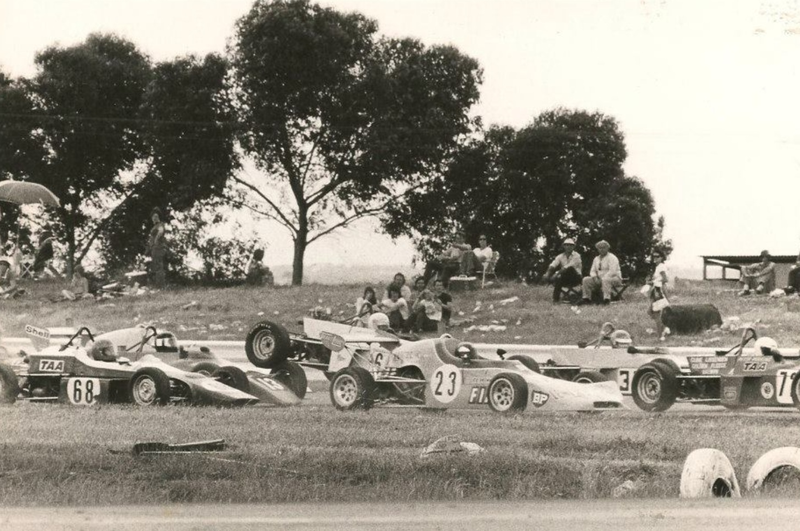 Many of the Symmons competitors contested support events during the Longford Tasman round a week before with the fields depleted by the likes of Noel Hurd’s Elfin 400 Ford due to an accident seven days earlier- Hamilton’s 906 made its debut race at Longford and was race favourite with the non-appearance of the powerful Elfin. 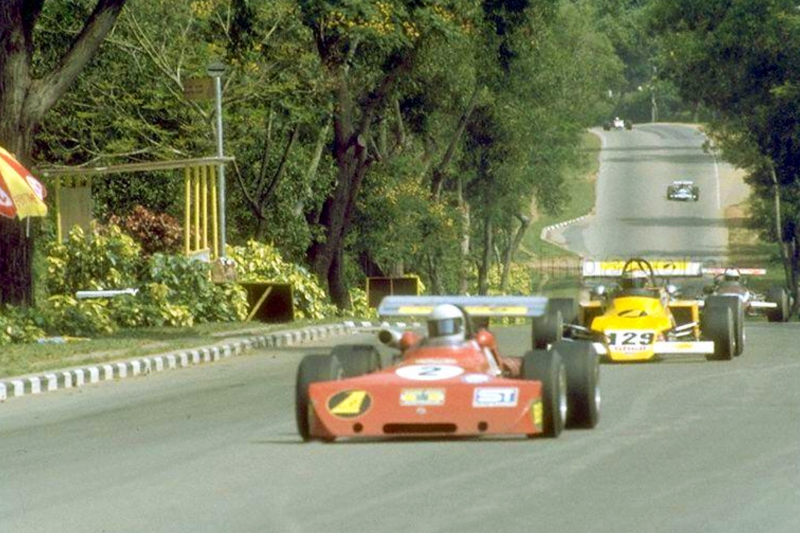 Alan was having a good day in the office with a Symmons preliminary win from Glynn Scott’s Lotus 23B Ford and Wally Mitchell’s RM1 Ford. 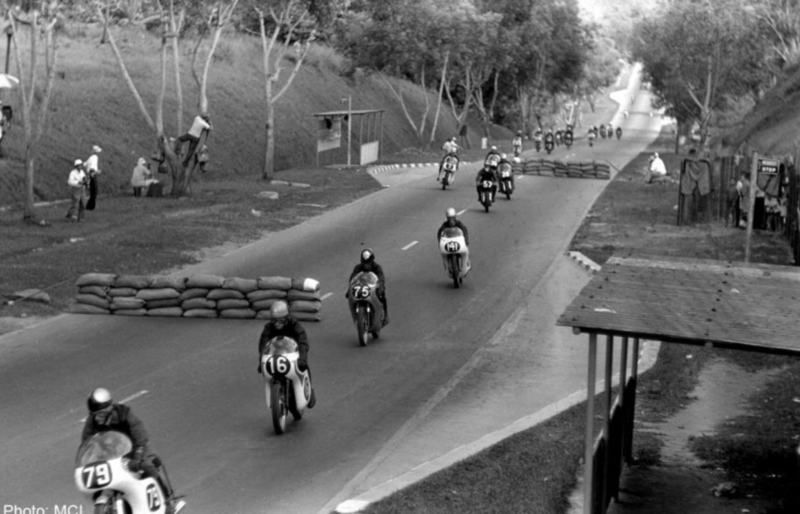 The grid for the 30 lap, 45 mile championship race was derived from the lap times achieved during the earlier event. 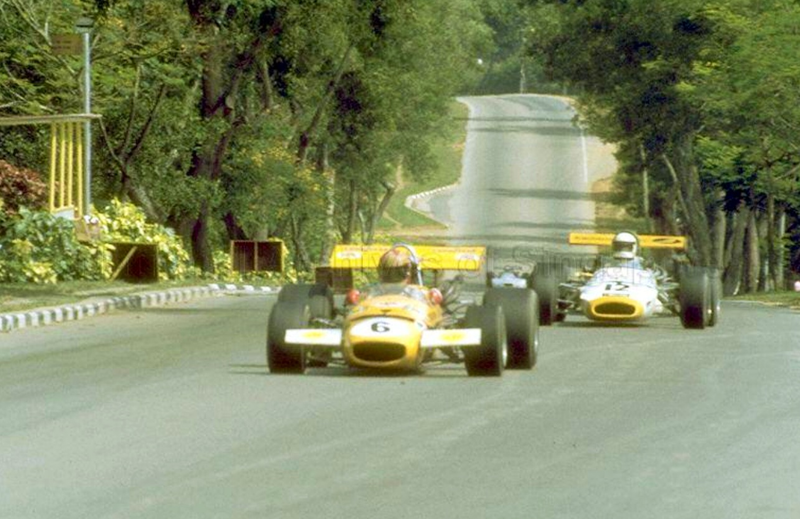 Hamilton started from pole with Scott and Mitchell alongside with Bruce Ling Lotus 23B Ford and Bob Holden in a Morris Cooper Lwt on row two. 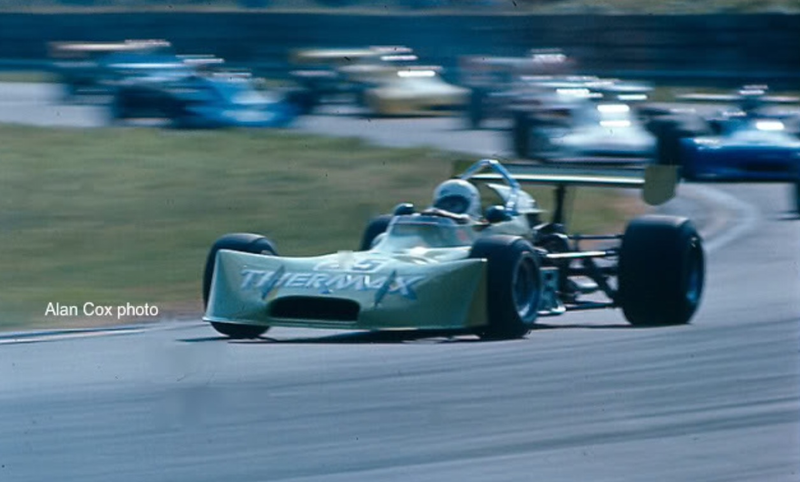 Scott led initially from Hamilton with Mitchell’s circa 350 bhp Chev V8 engined, spaceframe chassis car- built by he and St Kilda, Melbourne engineer/constructor Bill Reynolds, Bill’s cars were named Wren (R-Reynolds M-Mitchell) comprised a mixture of ex-Lex Davison Estate Brabham BT4/Cooper T62 and Wren components- passed by almost the entire field. 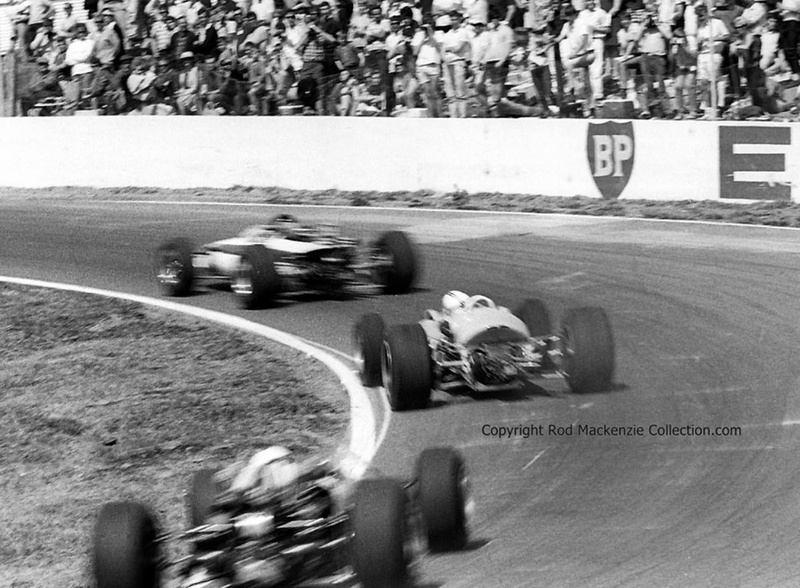 After 5 laps Hamilton had a sixty yard lead over Scott and had already lapped tailenders Mawdesley, Lotus Super 7 and Truscott’s Honda. 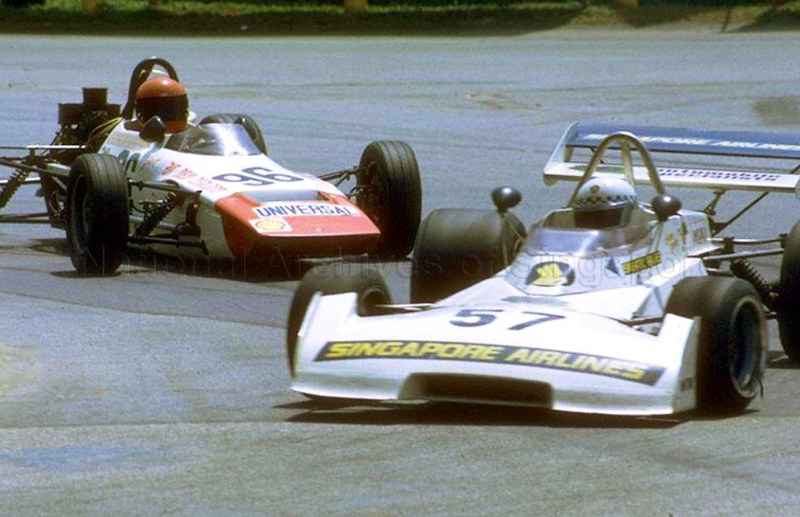 By lap 7 Hamilton led from Scott, Ling (who later lost 3rd gear) and Bob Wright’s Tasma Climax FPF 2 litre and was continuing to lap the slower cars. 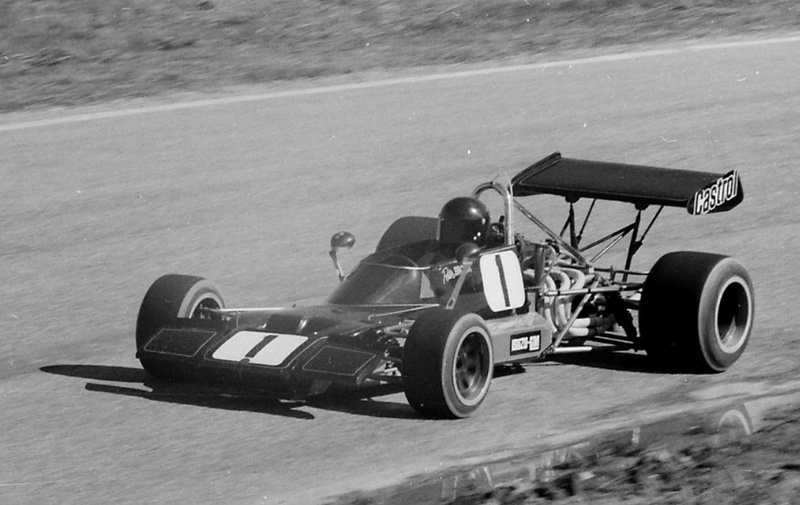 An arcane but interesting sidebar to Bill Reynolds/Wren enthusiasts, and there are quite a few of us in the Australian Formula Ford ranks given the number of FF Wrens Bill constructed, is that the Tasma Climax was initially built by Reynolds as the ANF1/Tasman Formula Wren Climax single-seater- it too fitted with an ex-Davison Estate 2.5 FPF but was only raced several times as such by Brendan Tapp and Wright before Wright widened the chassis and created the Tasma sports-racer. 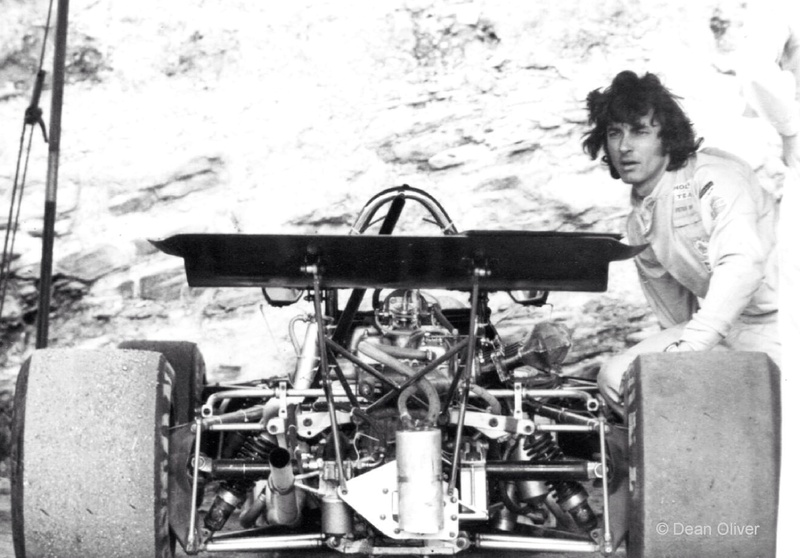 There is a story about both the RM1 and Wren Climax but that is for another time. Goss spun Tornado at The Hairpin allowing Bob Holden and Kerry Cox’ Jaguar Spl through, the order at this point of the 30 lap journey was Hamilton, Scott, plugging along and hopeful in second, Ling unable to do much with third gear absent without leave, Holden, Cox, Goss, Mitchell, still with a misfiring motor and then the rest. Wally Mitchell’s car finally chimed onto eight-cylinders and proceeded to make up lost ground over the slower cars hand over fist, he was up to third by lap 15 having passed Ling. 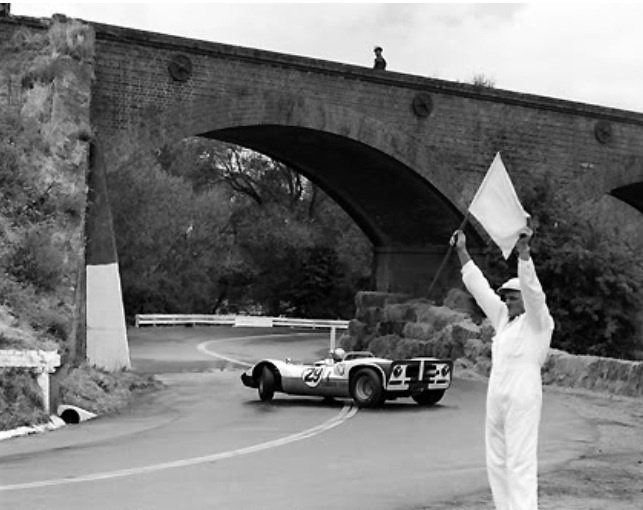 Tragically at half distance, on that lap, Mitchell lost control of the probably not fully sorted RM1- it was originally fitted with a lightweight aluminium Coventry Climax FPF engine where the 5 litre cast iron Chev by then rested- over Bessant Hump, went onto the grass, slammed into the fence tail first at TNT Corner, then bounced back onto the track. The cars two fuel tanks ruptured with both the car and unfortunate driver engulfed in flames. The badly burned Mitchell released his seat belt eventually and jumped clear but not before suffering burns to eighty-percent of his body. 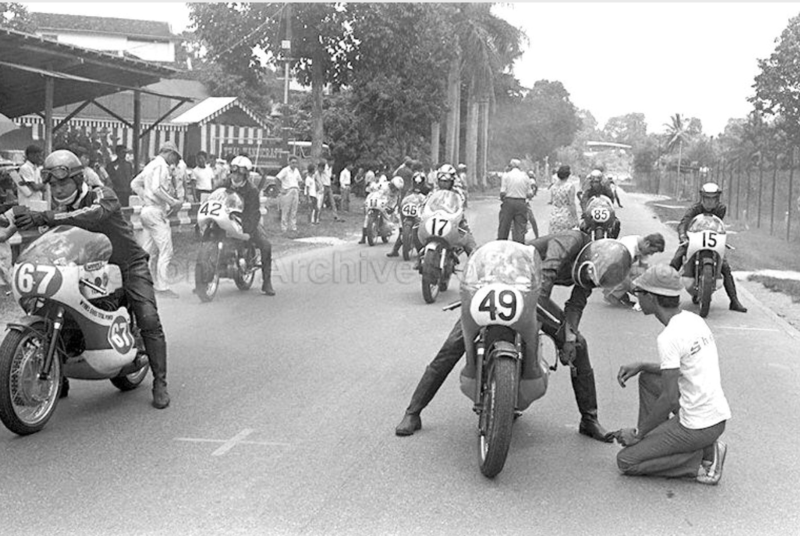 Whilst poor Wally was attended to ‘The race was restarted at lap 16 as…the gutted RM1 still cast a pall of smoke over the pits’. 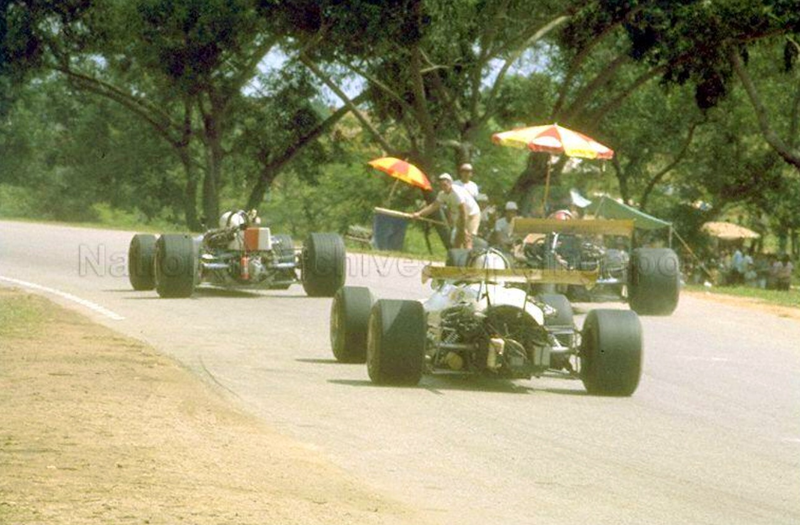 In the final laps Ambrose passed Ling, and Hamilton had a rod let go in the 906 on lap 26, the car expired at the Hairpin giving the win to Scott from Ling’s similar Lotus 23B Ford and Ambrose in the Rennmax Climax. The sad aftermath of the accident is that the popular East Burwood based Wally died of his burns and related complications of pneumonia on 18 April in a Melbourne hospital. 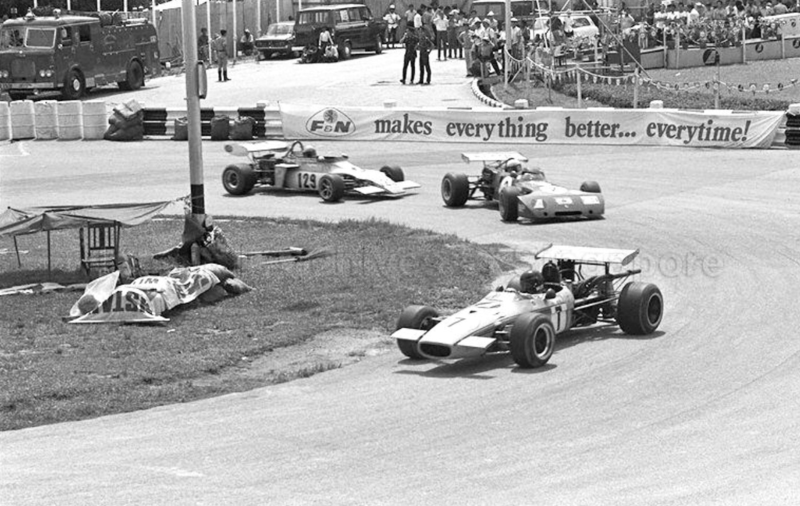 That’s Gossy to the right and the Peter Truscott Honda whilst up front it’s Hamilton’s white 906 sandwiched by two Lotus 23 Fords and then the Ambrose Rennmax and Mitchell RM1. 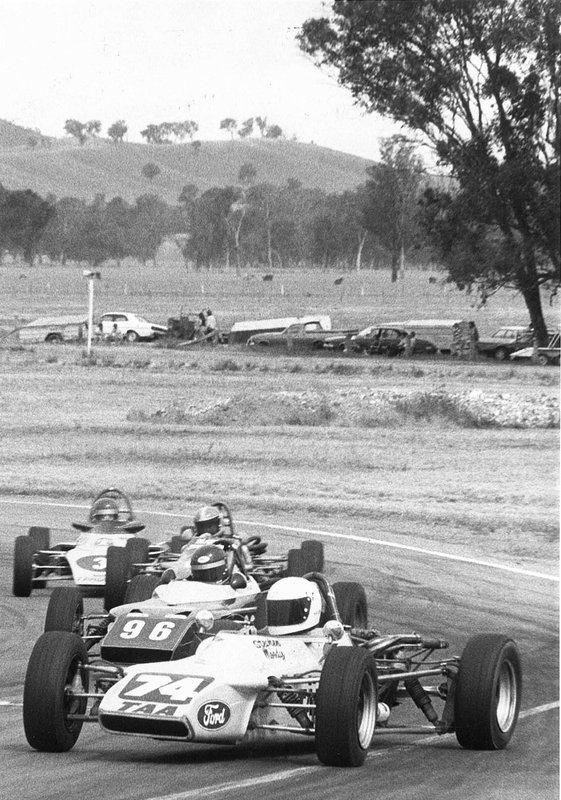 Goss, future Bathurst and Australian Grand Prix winner is leading Kerry Cox’s Paramount Jaguar, three-times Australian Grand Prix winner Doug Whiteford’s works Datsun Fairlady, Bert Howard’s Lola Mk1 Climax, the partially obscured Lotus 23 Ford of Alan Ling and then Peter Mawdesley in a Lotus Super 7. 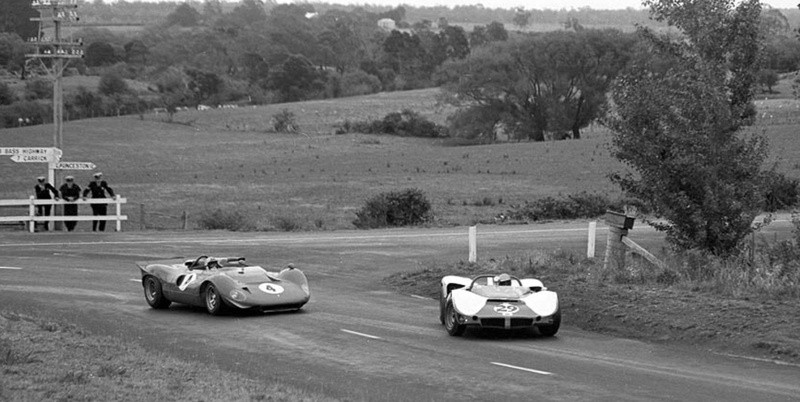 Out front out of shot is the ex-works Scuderia Veloce Ferrari P4/350 Can Am driven by Chris Amon from Ian Cook’s Bob Jane Racing Elfin 400 Repco, Peter Macrow in the Argo Chev, Lionel Ayers MRC Ford and Glynn Scott’s Lotus 23 Ford. 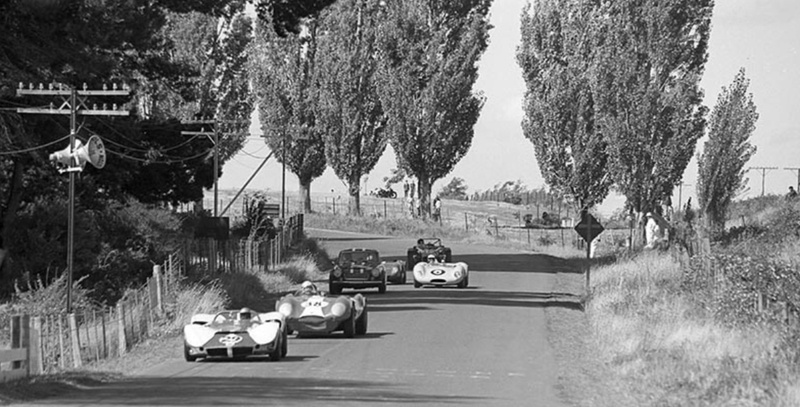 The opening shot shown is the second group of cars. The following shot is of Gossy losing Tornado on his turn-in to The Viaduct, I wonder if its the same lap! I think not, the track looks wet, which makes it the Monday. 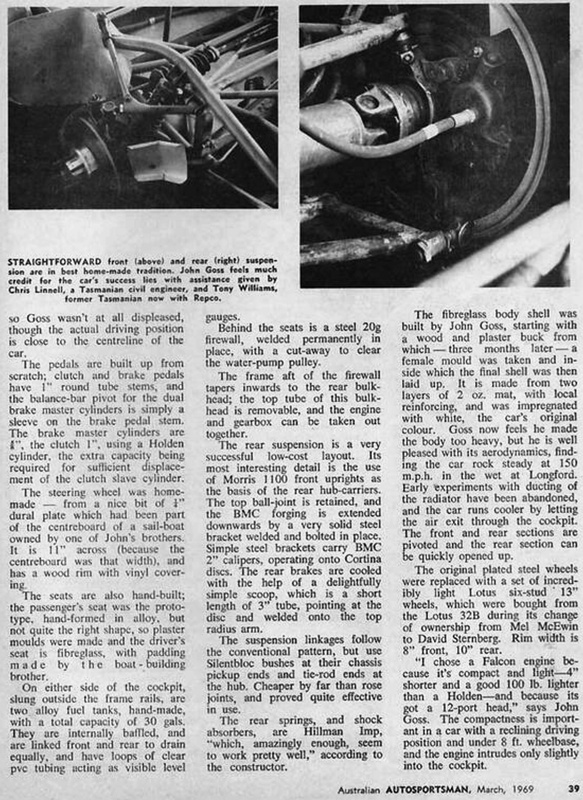 Amon’s Ferrari was pushed off the grid with a flat battery- he started the 10 lapper with 2 laps down and finished third- and did 178 mph in the wet conditions on The Flying Mile. 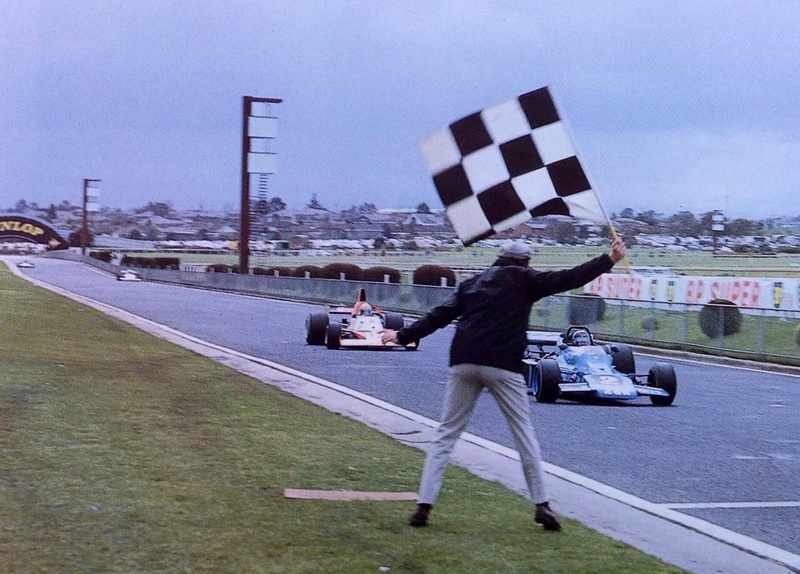 Peter Macrow won in Tony Osborne’s Argo Chev from Glynn Scott’s Lotus 23 Ford. 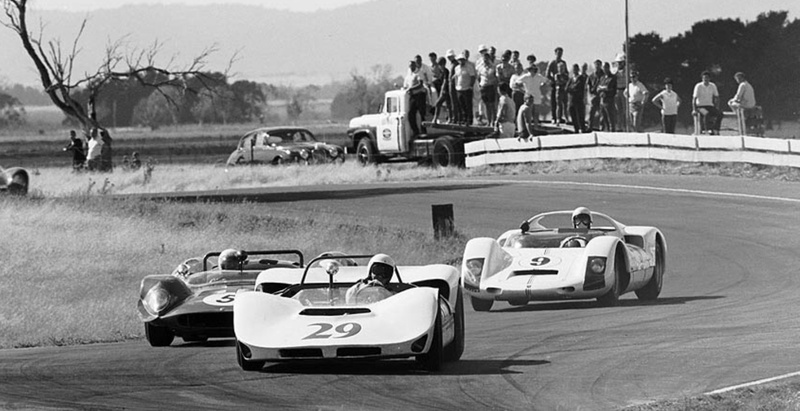 During the dry Sports Car Scratch race on the Saturday Chris won from Ian Cook in Bob Jane’s Elfin 400 Repco V8 and Peter Macrow in the Argo Chev. 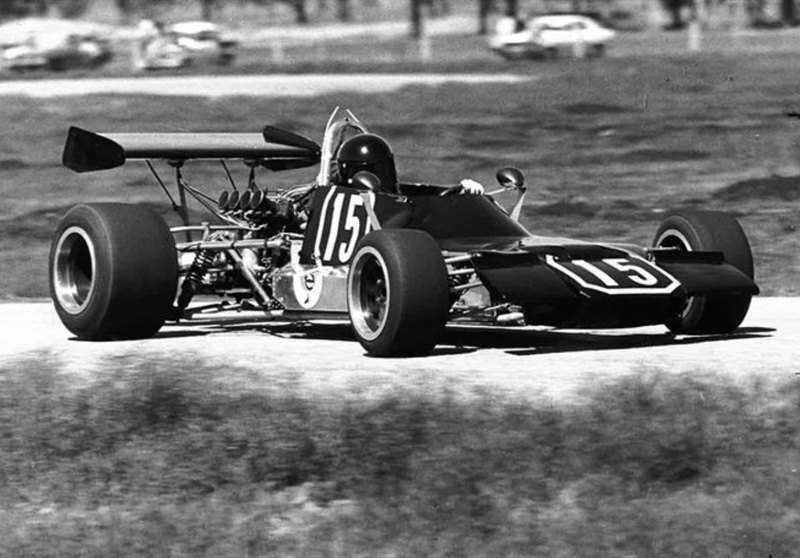 Amon, awfully comfortable in the P4/CanAm 350- in addition to his Ferrari F1 commitments he raced the cars in both the 1967 endurance races and some Can Am rounds, set an all-time Longford lap record of 2:16.2 undercutting Jim Clark’s Lotus 49 Ford DFW time of 2:13.0 earlier in the day. Mighty quick. 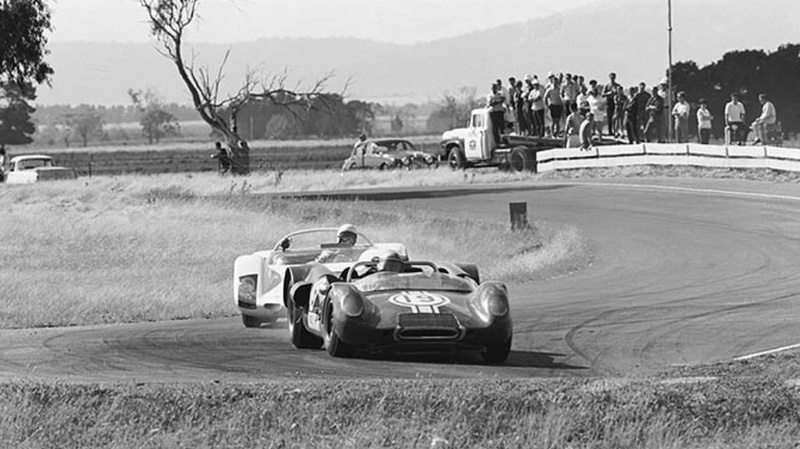 Mind you, that summer Frank Matich beat Chris’ Ferrari in the Matich SR3 Repco in the other Australian Tasman round sportscar support events. But FM did not cross Bass Straight to do Longford- sad! 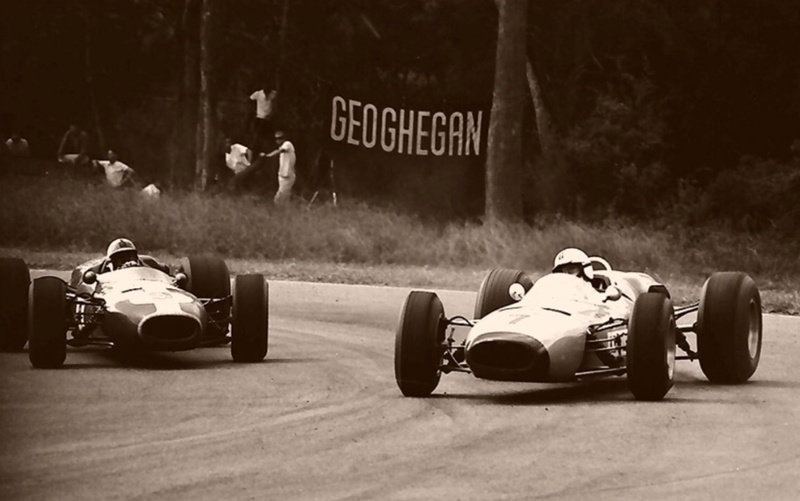 Those battles on that circuit would really have been something to see! Posted: May 7, 2018 in Icons & Iconoclasts, Who,What,Where & When...? 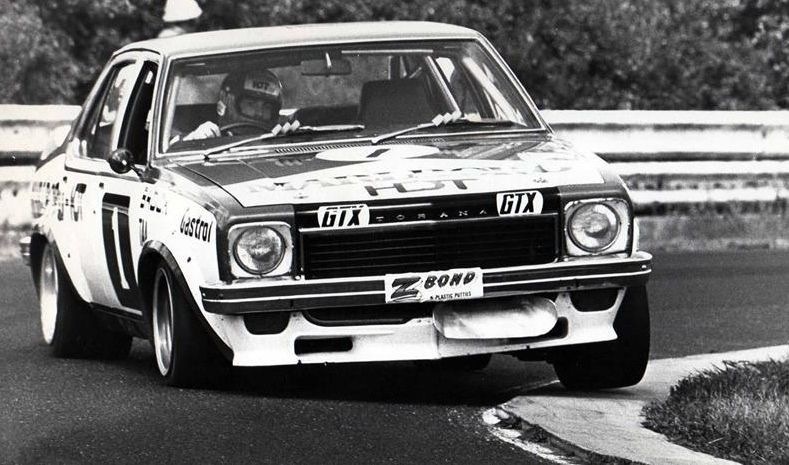 Brocky was very hot property in 1973 having seized the public spotlight with the last solo Bathurst win aboard his Holden Dealer Team Torana GTR XU1 in October 1972. Every young bloke in Australia wanted to emulate him, and many women wanted to shag him, including Miss Australia as it transpired! 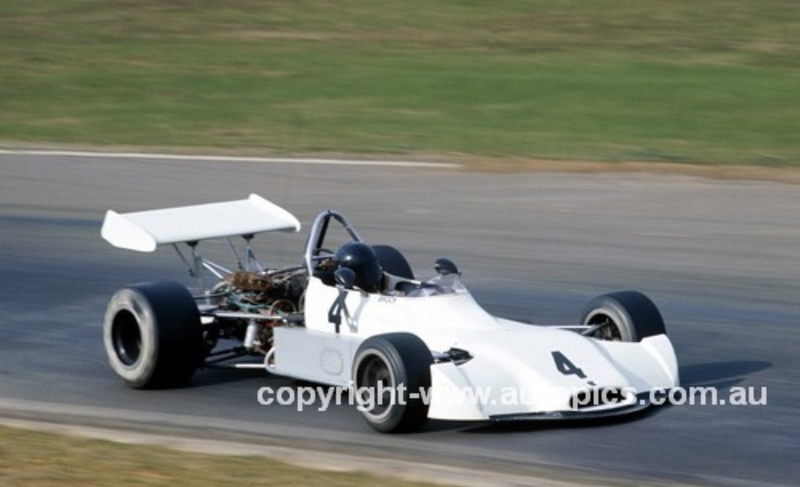 Purists were delighted when he bought 272-002, Tony Alcock’s first monocoque Birrana to contest the Australian F2 Championship, but sadly he didn’t race the car for long, soon returning to the touring car ranks. 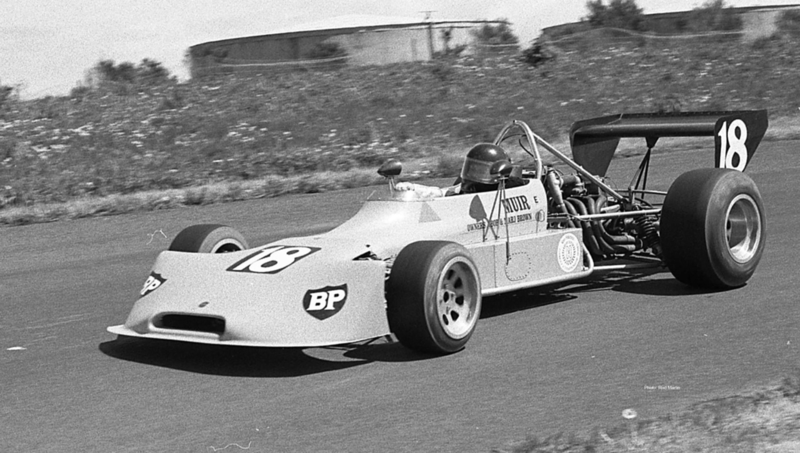 Tony Alcock’s first Birrana, the F71 Formula Ford was built in Sydney and initially raced by one of Brock’s touring car sparring partners, John Goss. 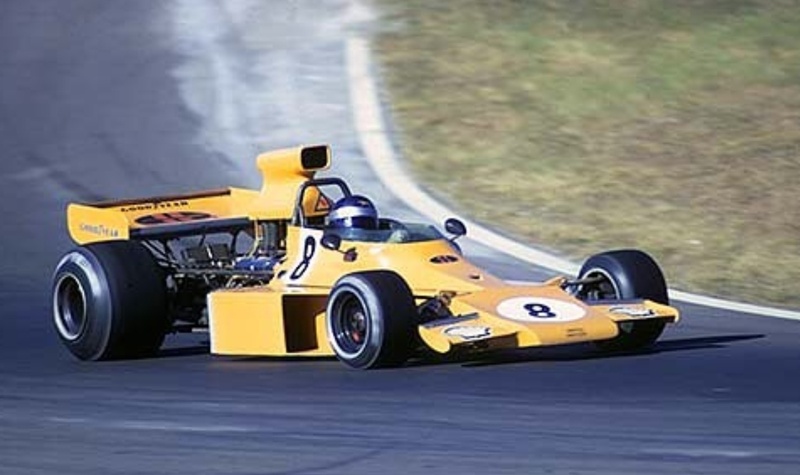 Then Tony returned to his Adelaide home town and started to build Birrana’s in numbers in partnership with Malcolm Ramsay- in 1972 building two F72 Formula Fords and 272-002. 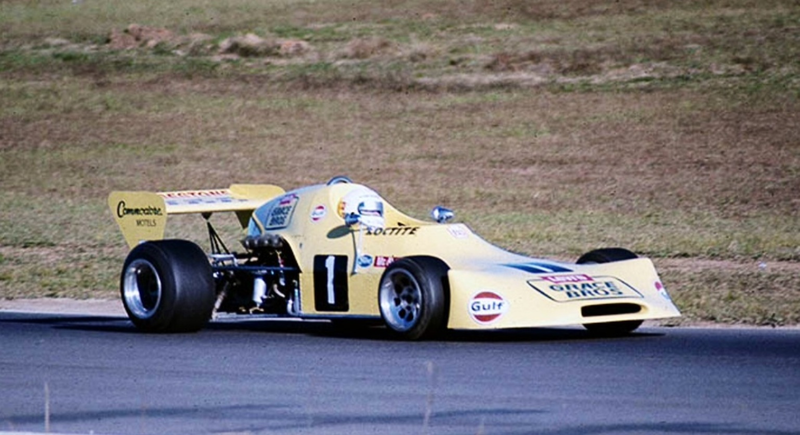 Their first ANF2 car was raced by Ramsay, dual Australian F2 champion Henk Woelders and Gold Star champion Leo Geoghegan before being sold to Brock. 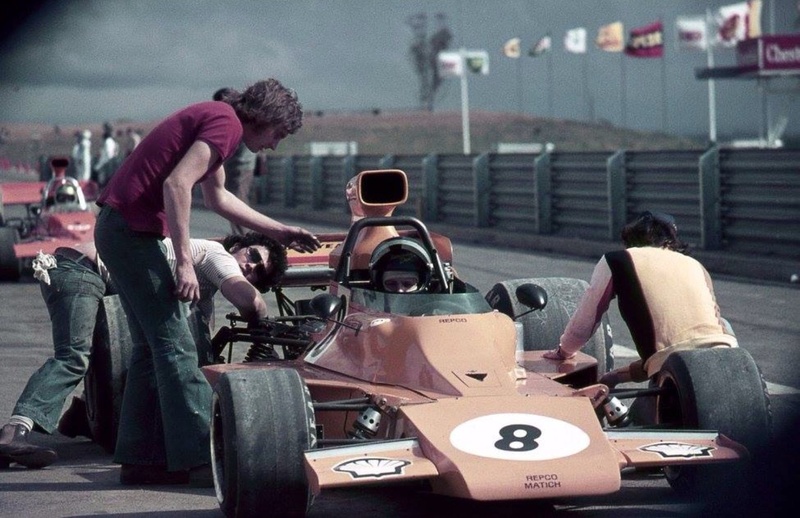 PB raced it at Hume Weir, Winton and Oran Park to get his hand in prior to the start of the 1973 F2 Championship which commenced at Hume Weir in June. 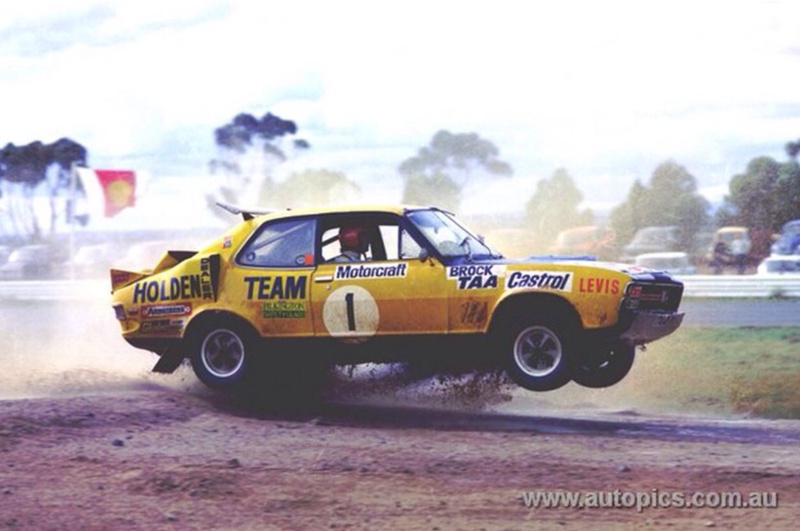 Brock was 2nd to that years champion Leo Geoghegan at Oran Park on 5 August and then 6th at Amaroo on 19 August, in a Birrana 273, chassis 273-008. He updated to the best car of the season, Geoghegan galloping to the title with wins in every round but one. 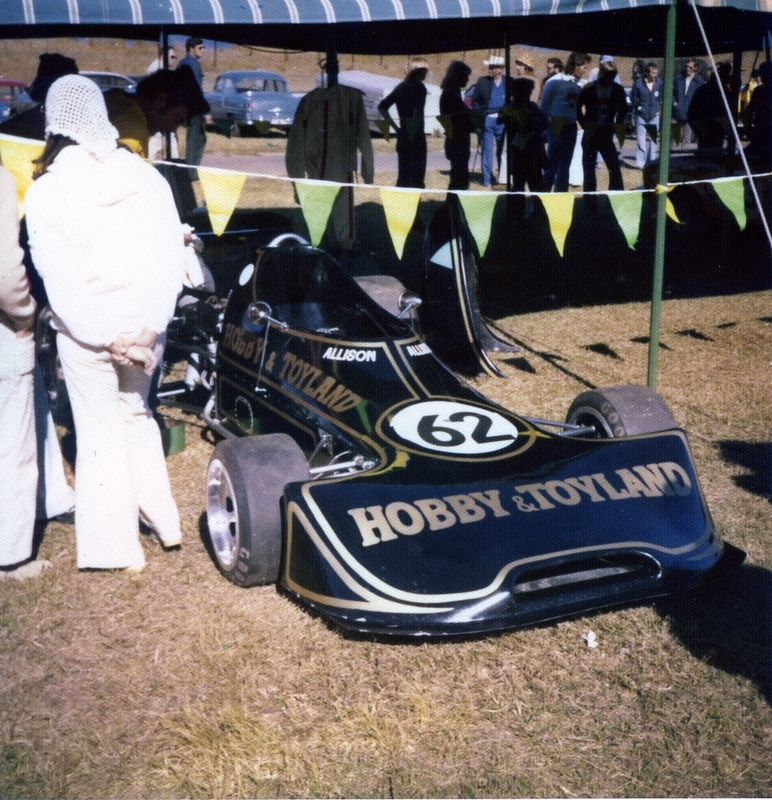 Its not clear exactly how many meetings Brock did in the two cars but he certainly raced the 272 at Hume Weir, Winton, Calder and Oran Park and the 273 at Oran Park and Amaroo Park. 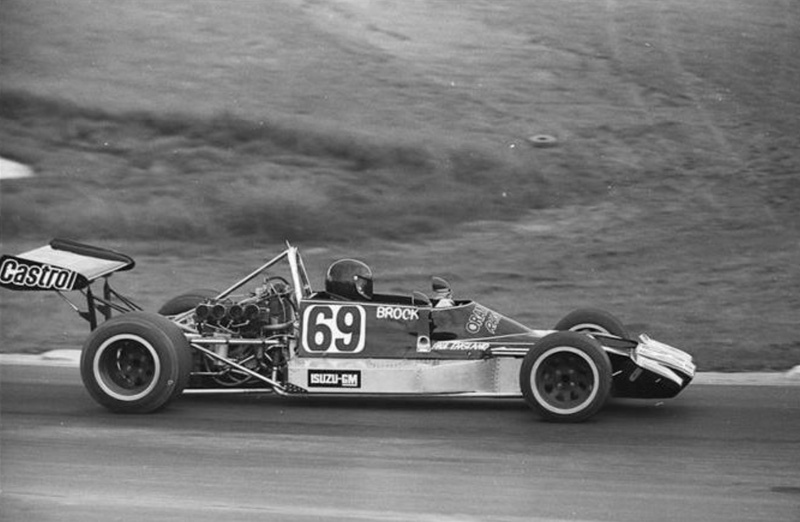 Running the Lotus Ford twin-cam engine was said to be a commercial barrier to the continuation of Brock’s F2 program given his Holden Dealer Team contract, but perhaps the reality of running his own car again with the assistance of his dad was just all too hard compared with being a works driver with all of its benefits. 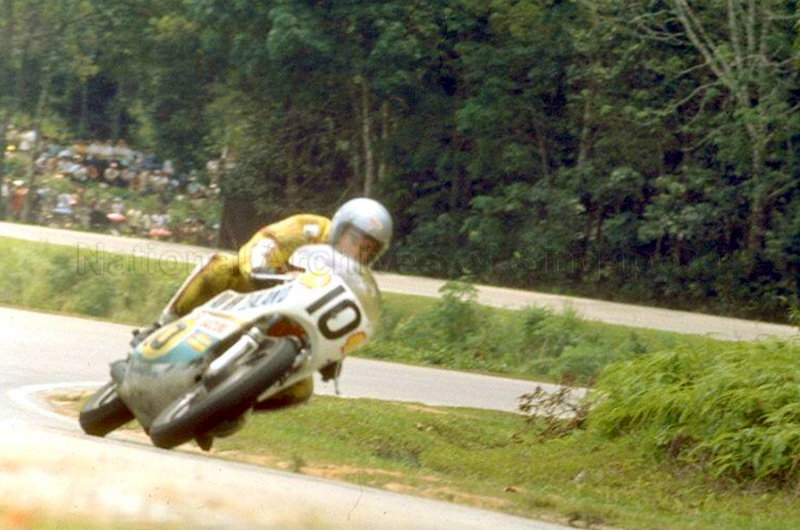 It was such a shame, Brock’s sublime skills deserved to be deployed in racing cars as well as the tourers of all sorts in which he excelled. 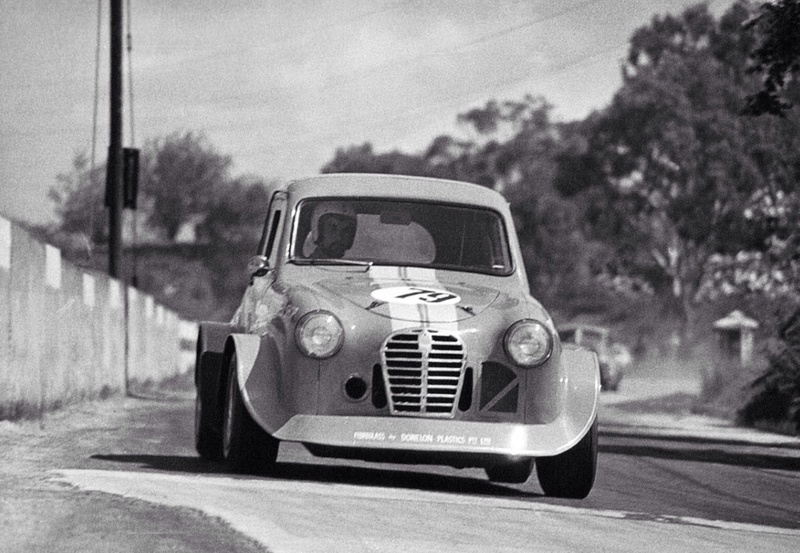 Brock’s talent was clear from the start aboard his Holden engined Austin A30- his aptitude very quickly accepted once others drove that car, none of those who raced it or track-tested it could work out how he did the times he did- not Ross Bond, Peter Wherrett or Rob Luck. 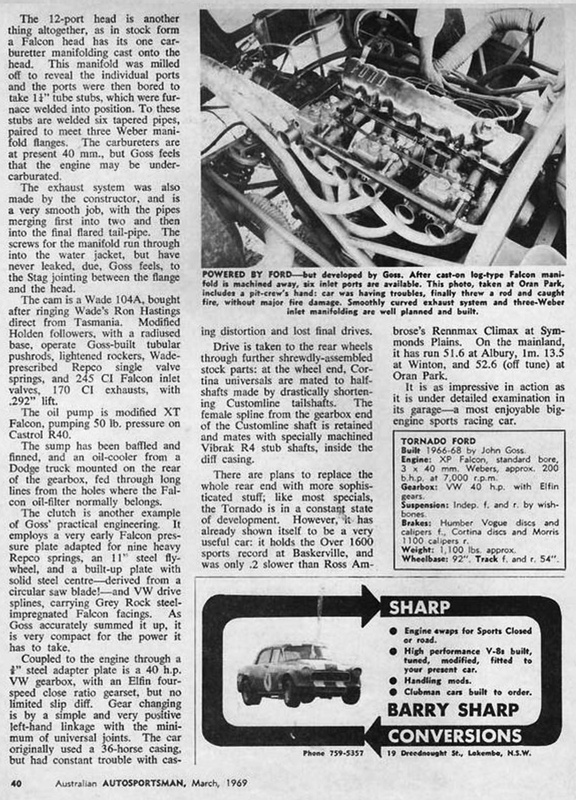 The little rocket was a mix of lightweight Austin stripped shell, highly modified Holden 179 6 cylinder ‘red motor’ giving circa 200 bhp using triple 2 inch SU carbs, Holden three, and later four speed ‘box, rear axle assembly wheel to wheel with a Holden front end and Triumph Herald steering rack with disc front brakes and drum rears. 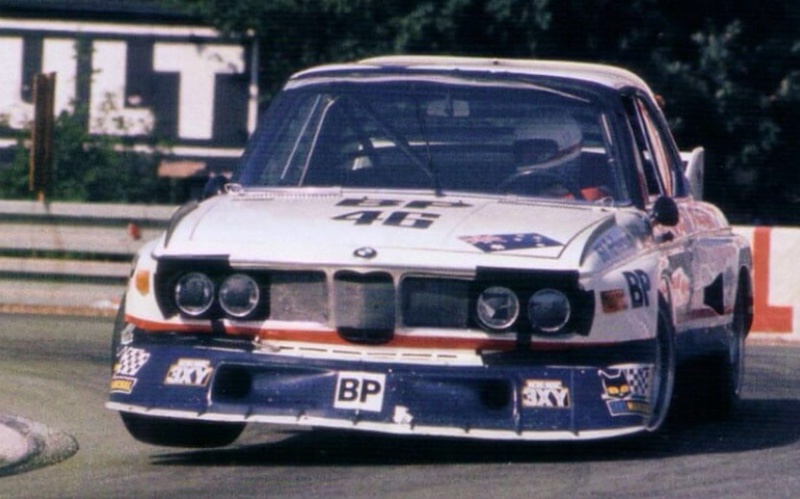 Steps in the right direction were his international drives at Le Mans in 1976 aboard a Bill Patterson supported BMW 3.5 CSL Group 5 machine paired with Aussie International Brian Muir. Now that would have been a career to emulate in terms of a mix of sedans and sportscars based in the UK? 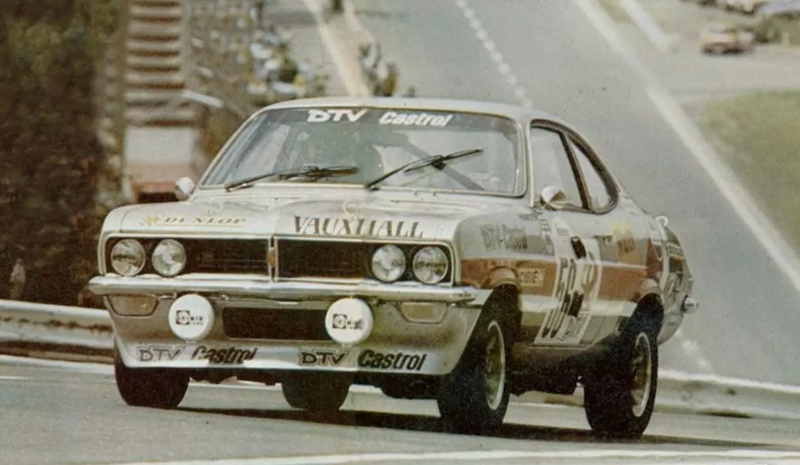 Spa in a works Vauxhall Firenza Magnum 2300 paired with Gerry Marshall yielded an amazing second outright in the 24 Hour classic in 1977. 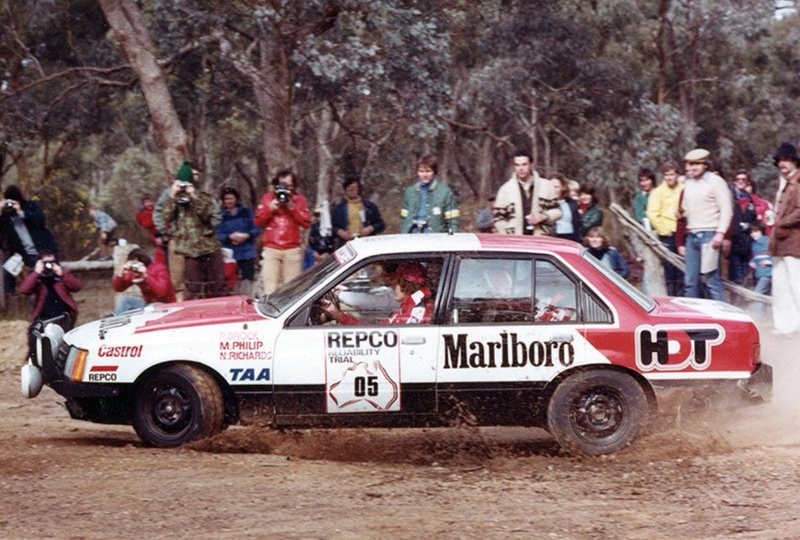 Brock’s status as one of the best Touring Car Drivers of them all was confirmed by MotorSport in 2005 who rated him the greatest in an article contributed to by an array of global commentators of the top-20 of all time. 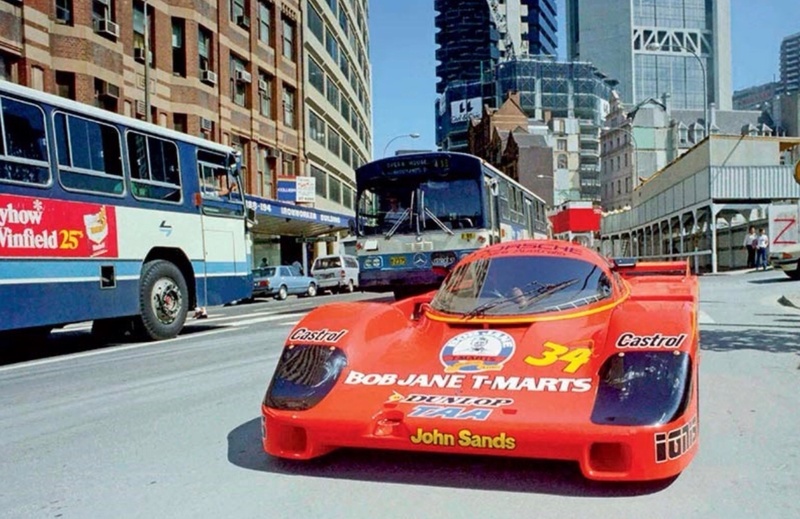 The Bob Jane supported attempt on the 1984 24 Hours of Le Mans, with Brock partnered by Larry Perkins in a customer Porsche 956 captured all of our imaginations and to me was exactly where that pair belonged and deserved to be. Sadly the warm-up Silverstone 1000 Km and Le Mans was as far as it went. At Le Mans they retired after an LP mistake during the night. 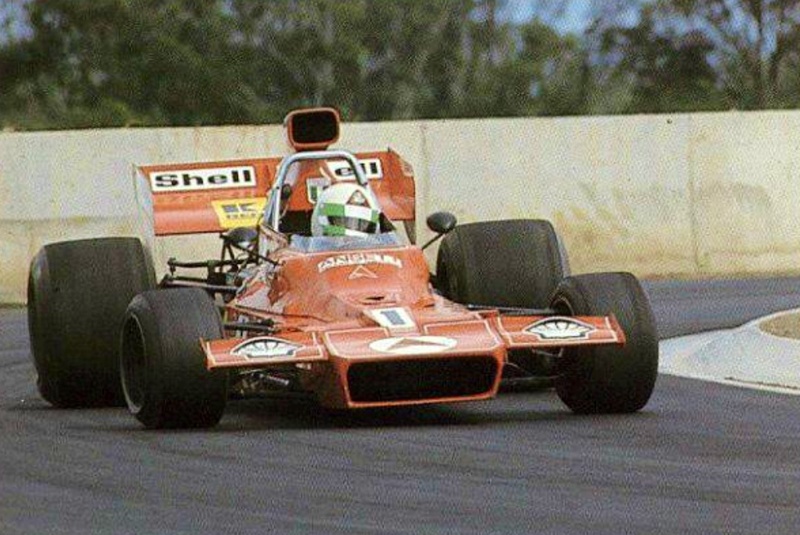 If only Brock had raced the 1974 Australian F2 Championship in a good car amidst one of the best grids of any single-seater championship in Australia ever- with success his career direction may have encompassed racing cars as well as tourers, rallycross, rallies. Not half versatile was he? 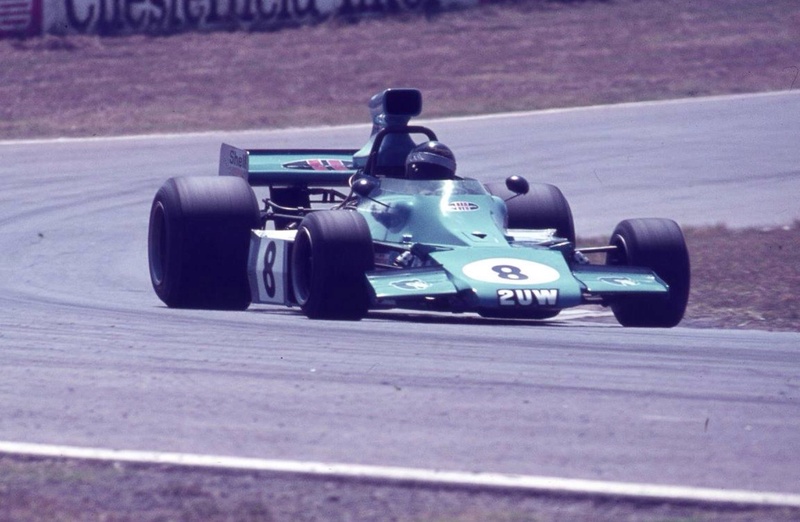 David Atkinson’s depiction of Kevin Bartlett’s dice and achievement of the first over 100 mph lap of Mount Panorama shows the Brabham BT11A Climaxes of KB and Spencer from Greg’s Brabham BT23A Repco V8. 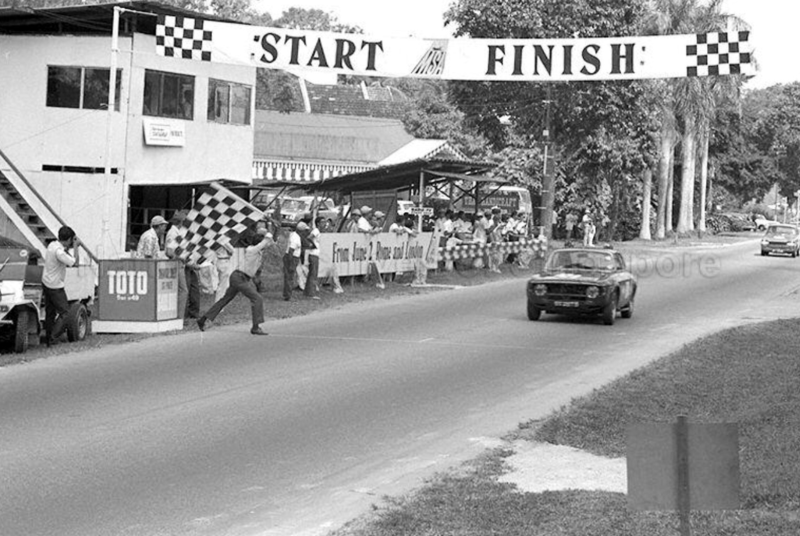 Bartlett first raced a Morris Minor at Bathurst in the late fifties, he knew the place as well as anyone- the sense of achievement was great. 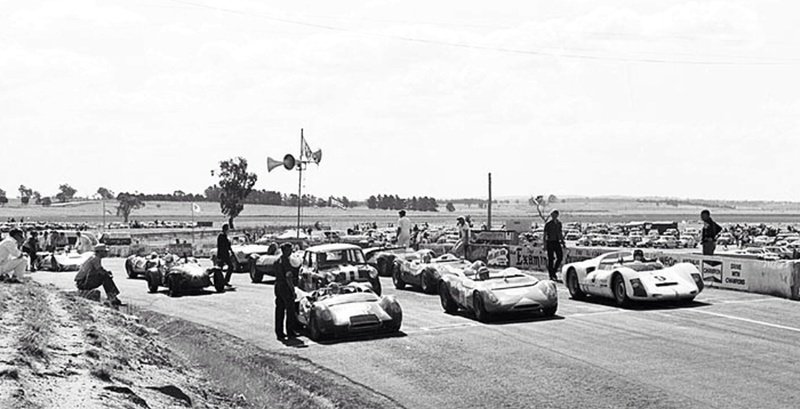 ‘Bathurst: Cradle of Australian Motor Racing’ is the title John Medley gave his wonderful ‘biography of Bathurst’ and goes a long way to making clear the significance of this wonderful place and it’s importance in the continuing pantheon of Australian motor racing. Only Lobethal and Longford match it for its majesty and Warwick Farm, Phillip Island and Albert Park it’s importance. 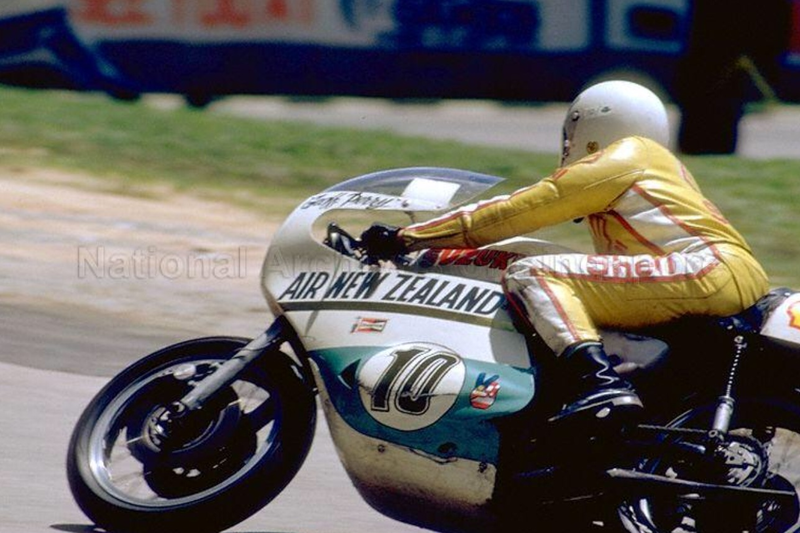 During a couple of torrid dices in a preliminary race and in the NSW Road Racing Championship round Bartlett and Martin both broke the lap record and 100mph mark repeatedly but Kevin was the first to do so. 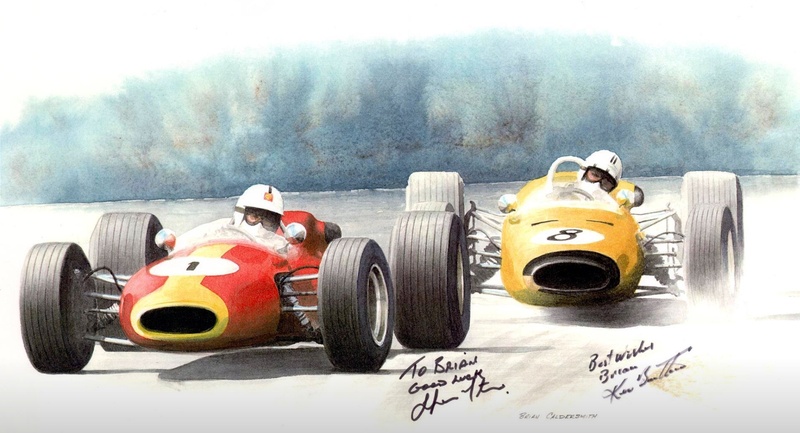 Both Sydney boys, both born in 1940, both motor mechanics by profession, both drove for one of the best teams of the day in Alec Mildren Racing and Bob Jane Racing- both raced Brabham BT11A’s powered by 2.5 litre Coventry Climax four cylinder ‘thumpers’ and both were sublime practitioners of the single-seater driving art. Driver’s-Drivers if you will. 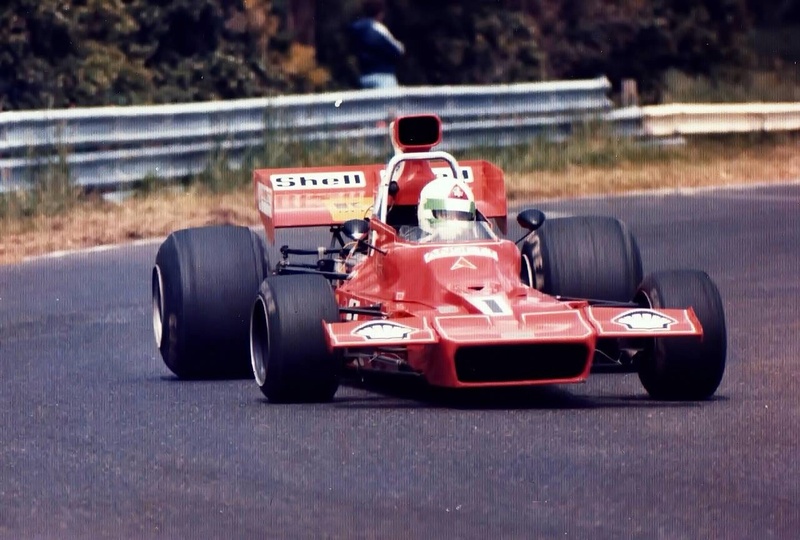 Spencer had greater experience of these powerful single-seaters than Kevin but the Curl-Curl Kid was learning fast, a classicist with god-given intuitive feel and car control that thrilled the crowds and record books for decades. 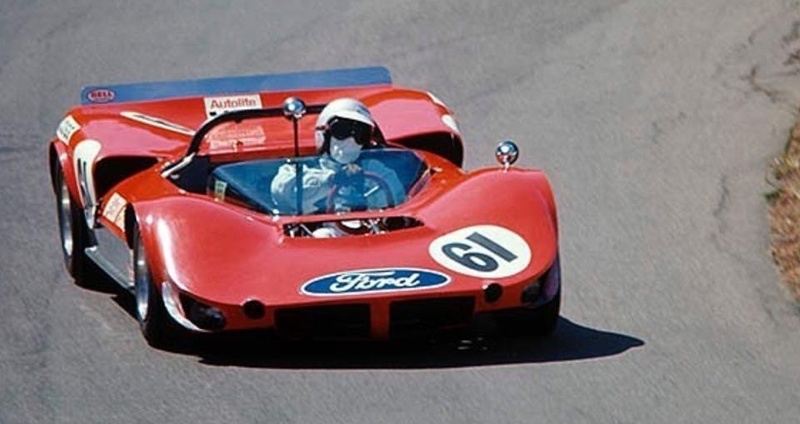 Bartlett declared his intent in practice with an over 100 mph lap of 2:18.6 with KB setting a time of 2:17.7 in a 6 Lapper for Racing and Sports Cars in a fierce battle with Spencer- in the process Martin matched KB’s 2:18.4 he had set on lap 3, only for Bartlett to do a 2:17.7 late in the race. 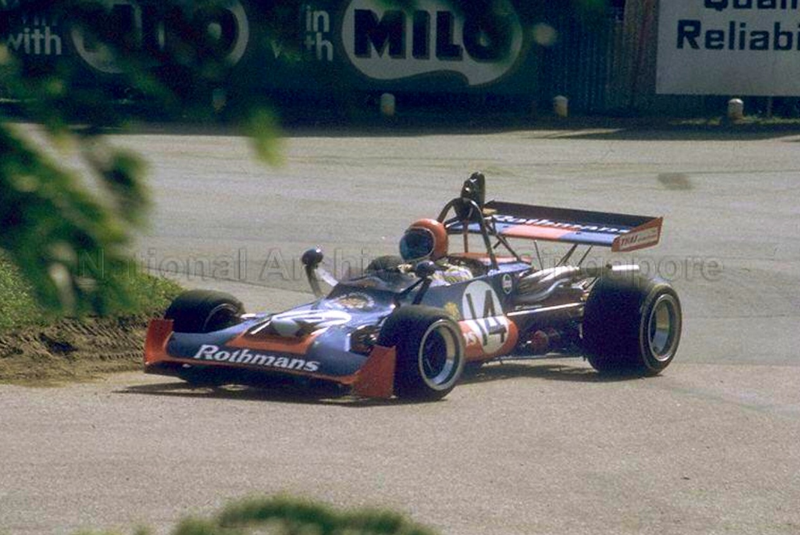 In an amazing weekend for Bartlett he contested four races winning three- two single-seater events in the Brabham and a touring car race in Alec Mildren’s Alfa Romeo GTA- he was second to Bob Jane ‘s Mustang in the other race. 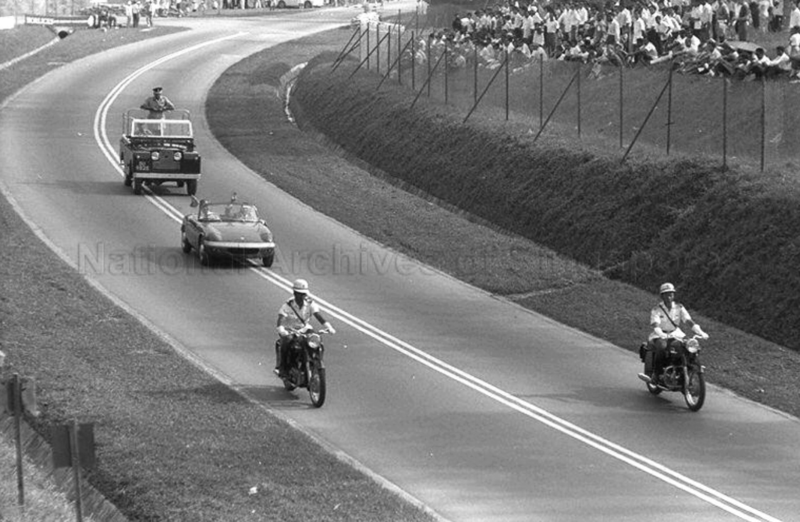 But the thriller of the four was the feature race. 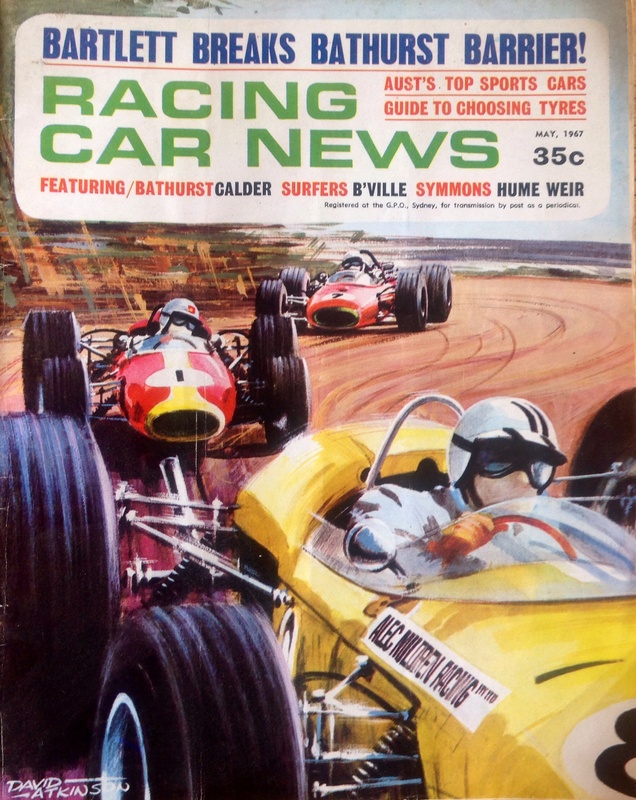 Peter Wherrett, then racer and later immensely gifted automotive TV broadcaster covered the meeting for Max Stahl’s monthly Australian motor racing bible ‘Racing Car News’, his account brings the thrilling weekends racing to life. 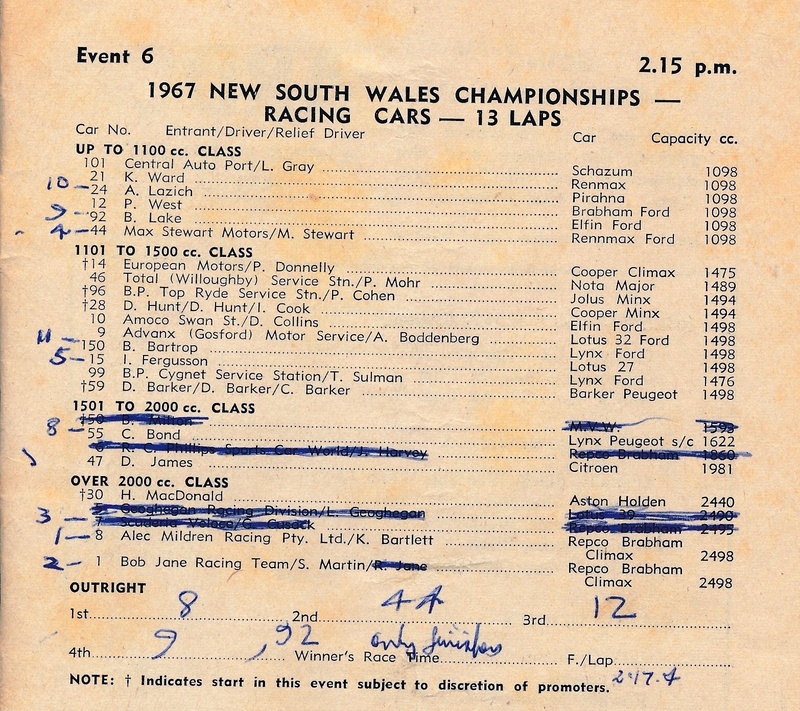 ‘The feature event in the nine race program was the 1967 NSW Championship for Racing Cars…it was a thriller but disappointing as well…Geoghegan and Harvey were installing new engines and were indisposed…Then right there on the grid…poor Greg Cusack and his team pushed and shoved the Brabham all over the place, but the big Repco V8 refused to start’. 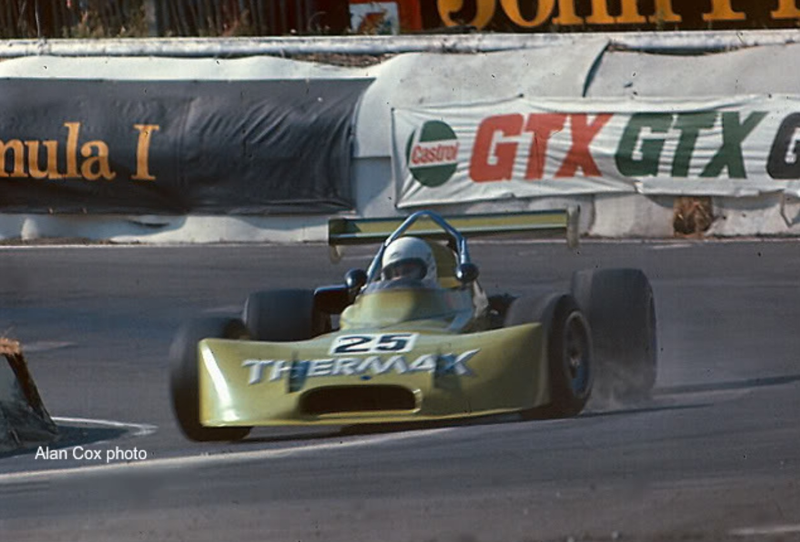 ‘Already way back in the field Max Stewart led the 1500’s…F2 Rennmax…Phil West 1100 Brabham running in close company with Alton Boddenberg in the Lotus 32’. 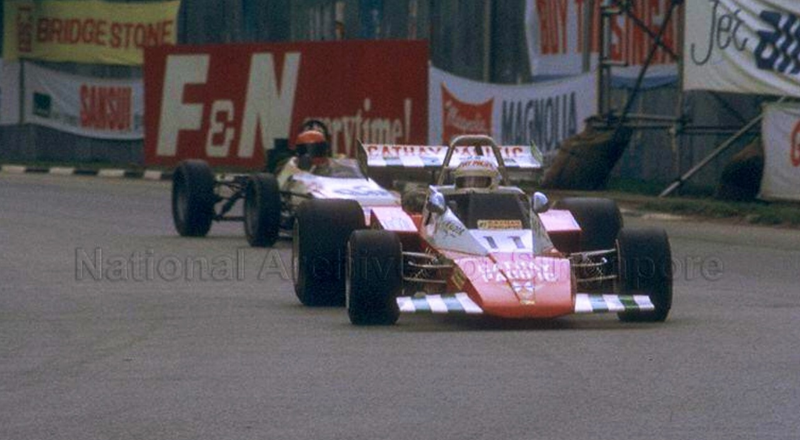 ‘But it was the Bartlett-Martin duel which was drawing the attention of the masses. Bartlett’s second lap put him 30 yards in front and this was not surprising when it was announced that the lap record was now 2:17.4. Too much!’. ‘Spencer was right in there though, and on the third he picked up a bit. Into the fourth they went and again Spencer seemed to catch Kevin going up the hill and Kevin seemed to gain it all back again on the straight. On the fifth of thirteen, people began to doubt they could both withstand the pace. Again Bartlett was in the 17’s but this time Martin joined him with a personal best of 2:17.8 and then…it was just too good to last. We crazy money-paying enthusiasts are just not deserving of such joy. 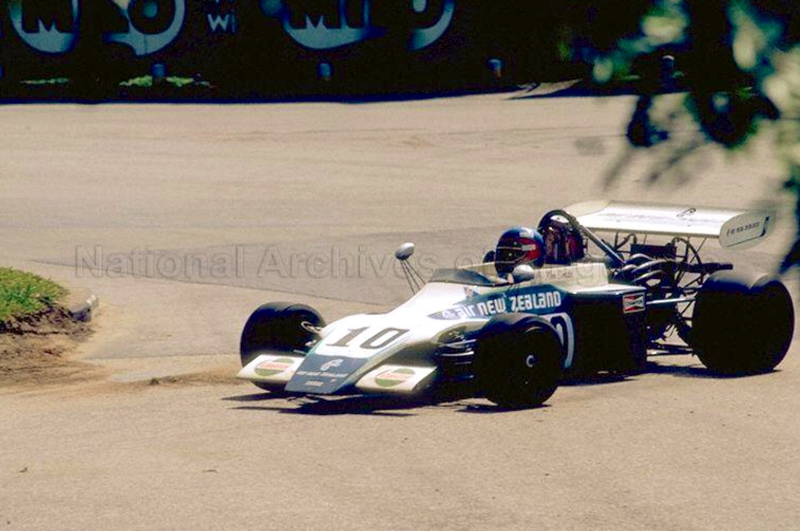 Going up to XL Bend for the sixth time Spencer slowed and with oil pressure failing withdrew the ailing Brabham. Bartlett slowed (?) to the low 20’s and could not be beaten. 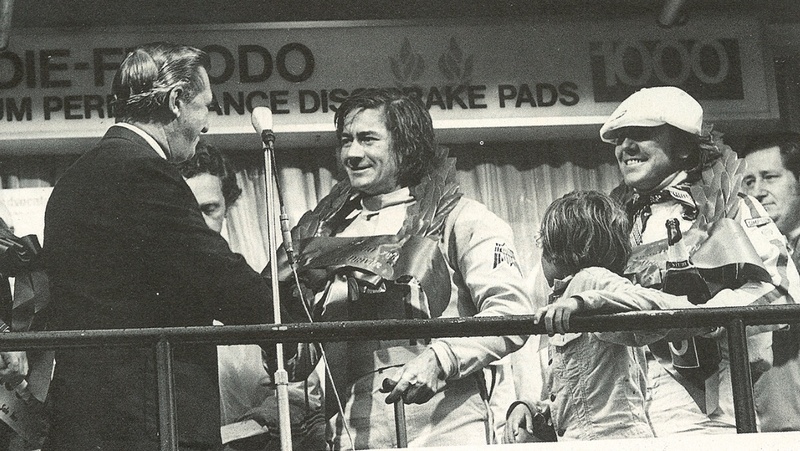 Stewart took second place, mad with glee, and Phil West gained a creditable third from Boddenberg, Barry Lake and Peter Cohen, who was in and out of the pits and only completed three laps’. 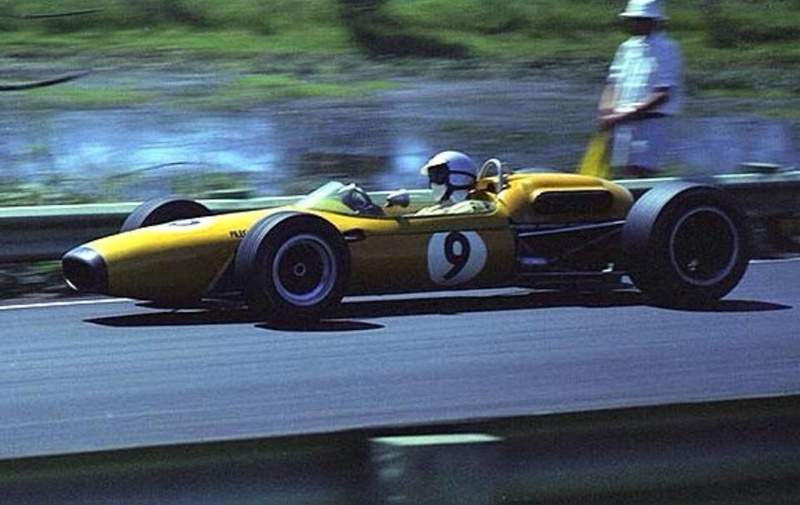 ‘All but one of Bartlett’s laps were under the old lap record, and six of them were under the magic 100 mph lap (2:19.5)’. Its interesting to look at the speeds recorded through the flying 1/8th of a mile that Easter long weekend. 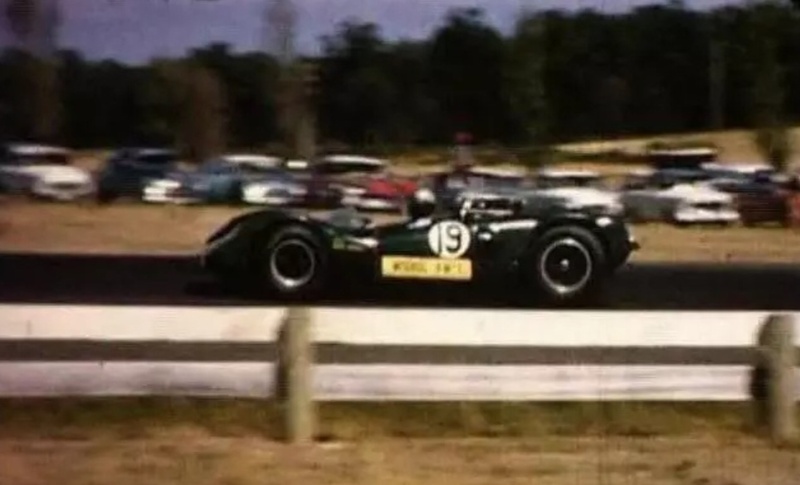 Cusack’s Repco V8 powered Brabham was the quickest open-wheeler at 162.45 mph, a time he recorded in practice with Bartlett and Martin doing identical times in their identical cars during the NSW Championship race- 159.57 mph. 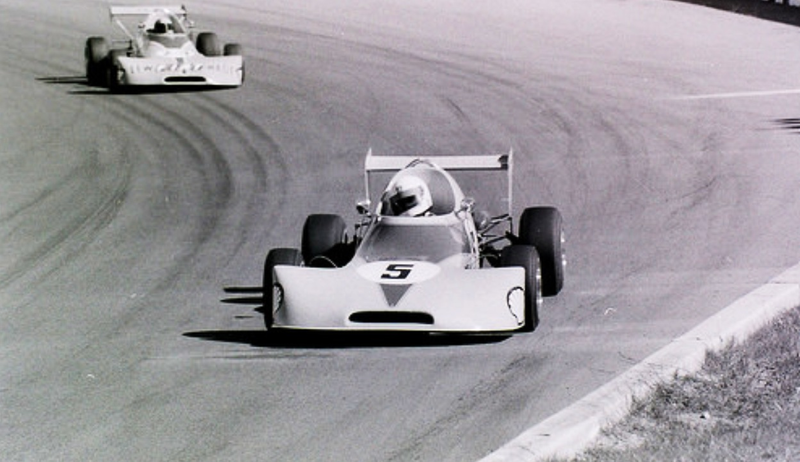 The quickest car over the weekend in a straight line was Bob Jane aboard his 4.4 litre Repco RB620 V8 engined Elfin 400 sporty, with 163.63 mph. 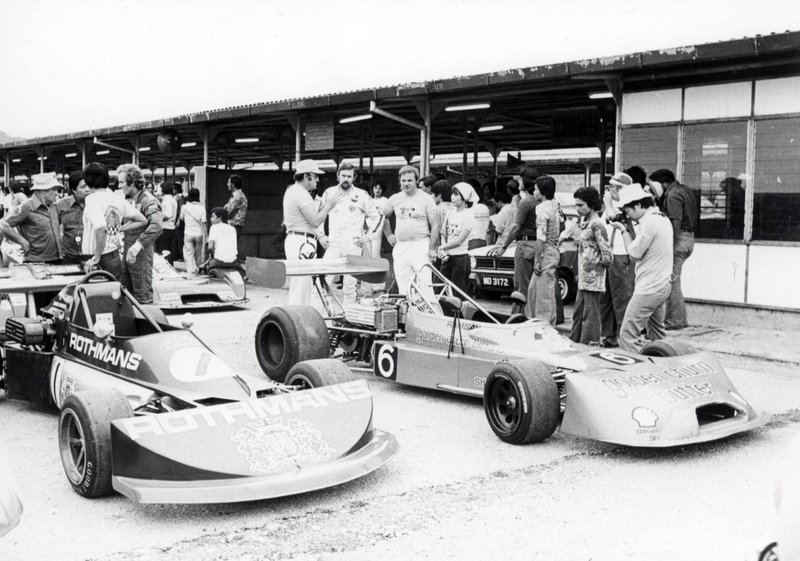 ‘Ron Hodgson, who probably thought he was on a good thing with his offer, had to part with 100 bottles of bubbly for the first 100 mph lap, and these were added to Kevin’s 25 bottles scored on Sunday for fastest practice lap’ Wherrett wrote. ‘…We were at it hammer and tongs. We were both pretty gung-ho. 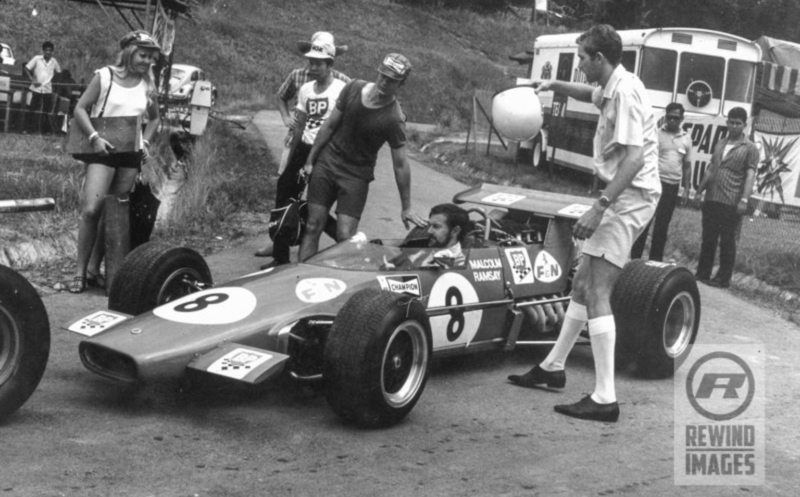 I was probably a bit more aggressive…Alec was really on the ball…I wouldn’t have attempted what I did otherwise. I came in after first practice and he said “Where do you reckon you can get the laptime” He knew the circuit, look, he knew it…”What if you short shift here, leave it that gear there, what revs are you using? He was at me’. ‘I was the train (engine) and Spencer was the guards van. He broke the 100 mph mark, too don’t forget. Always remember that. But because I was leading and crossed the line first, I got the credit. And when it came to the run of the race. I out braked him by outbraving him- it was one of those do or die things. I said to Alec later “Spencer and I got pretty close, Alec”. “We nearly lost the lot”. He said “Yeah, but you outbraved him didn’t you?” That was the way he talked’. Later ‘When Alec asked me what I was going to do with the champers, I said I don’t want it, you have it, and he said “Good, I’m going to throw a party”. 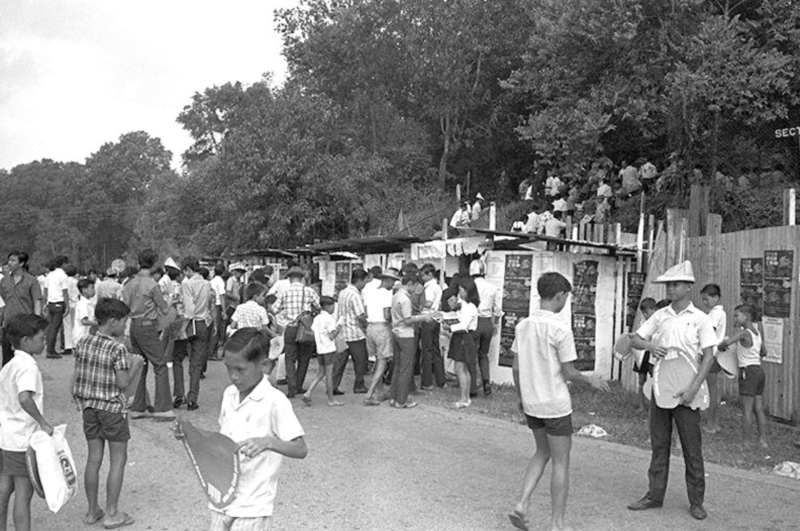 Anyone and everyone in motor racing was invited to the splash-out at the Mildren Newport (Sydney North Shore ocean beach suburb) residence…Alec was never a boozer- he was an orange juice man. But I’m sure he had a champers or two that night’ Bartlett recalled. 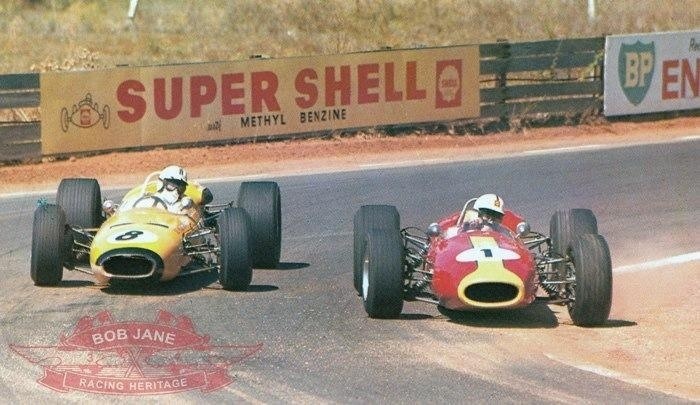 Whilst Bartlett was the hero of the day at Bathurst, Martin again won the 1967 Gold Star, as he did in 1966 with two wins (Surfers Paradise, Mallala) to Cusack and Bartlett’s one apiece (Symmons Plains and Lakeside). 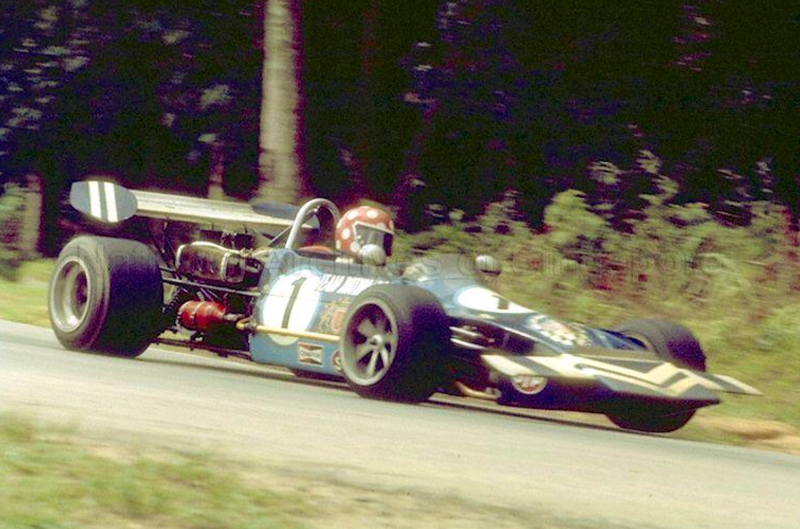 The two BT11A’s would have been the most highly developed cars of their type in the world with Martin and Bartlett both having, just, the legs of the Repco V8 engined cars of Cusack, Leo Geoghegan and John Harvey- Brabham BT23A, Lotus 39 and Brabham BT14 respectively. 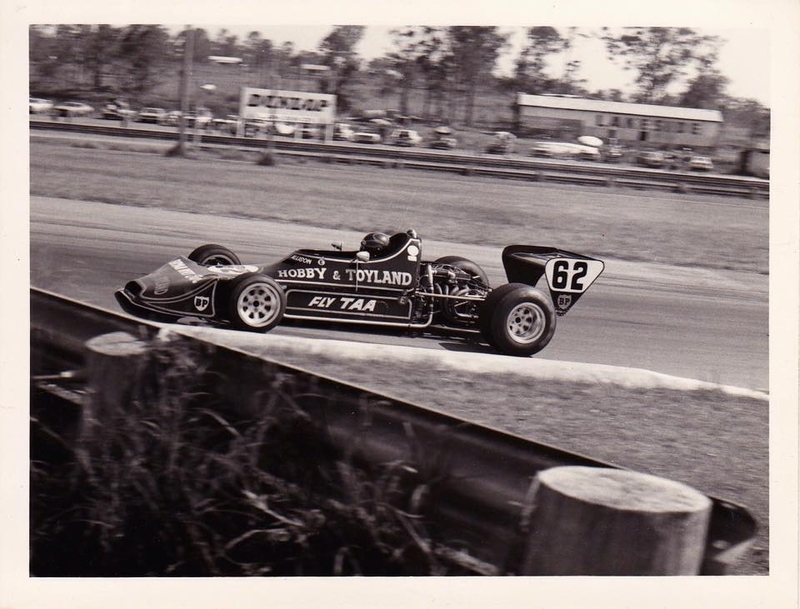 Spencer’s Bob Jane Brabham was more reliable than KB’s however, Spencer took the title with a points haul of 30 from Cusack 23, and Bartlett 16. 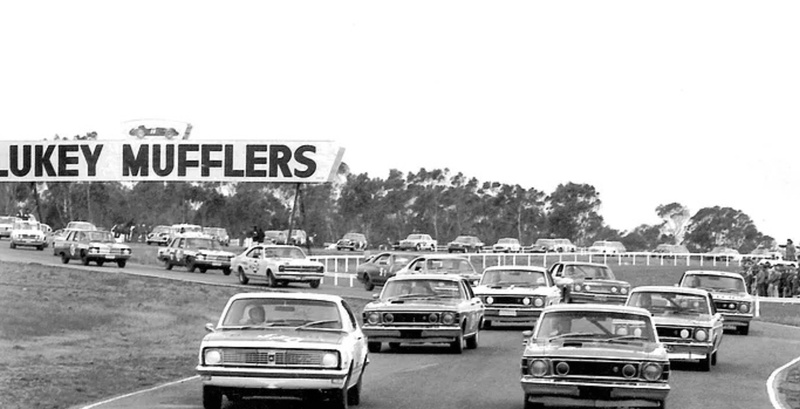 Bartlett and John Goss in the Bell cap (Greg Bartlett is the kiddo with his back to us) on the Bathurst 1000 victory dais in 1974. 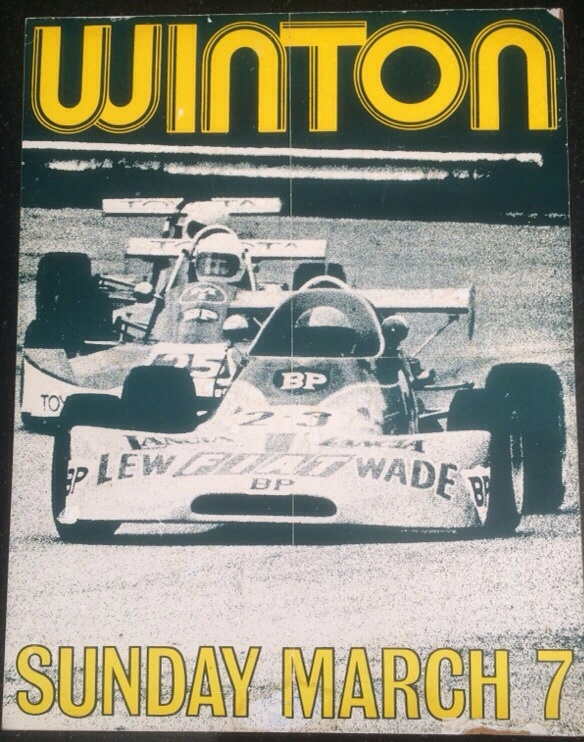 What a sweet win for them both- especially KB who had a bad accident at Pukekohe at the seasons outset during the Tasman Series, he became a ‘Lola Limper’, breaking a leg when his T330 Chev came to grief, a lengthy recovery period followed. That’s a walking stick in the young veteran’s left hand, quite a few of his fans shed a tear watching his gritty performance that day and this presentation on the telly, me included. 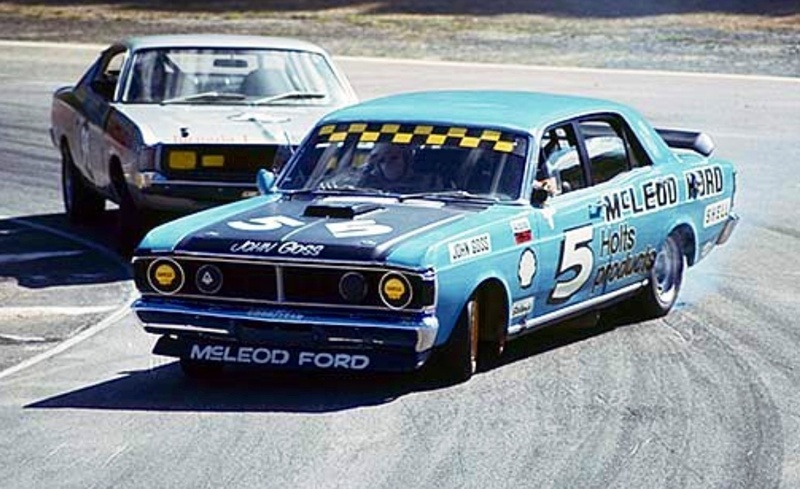 There are plenty of Fords behind- Moffat/John French won from Tom Roddy/Murray Carter and Fred Gibson/Bo Seton all in HO’s. 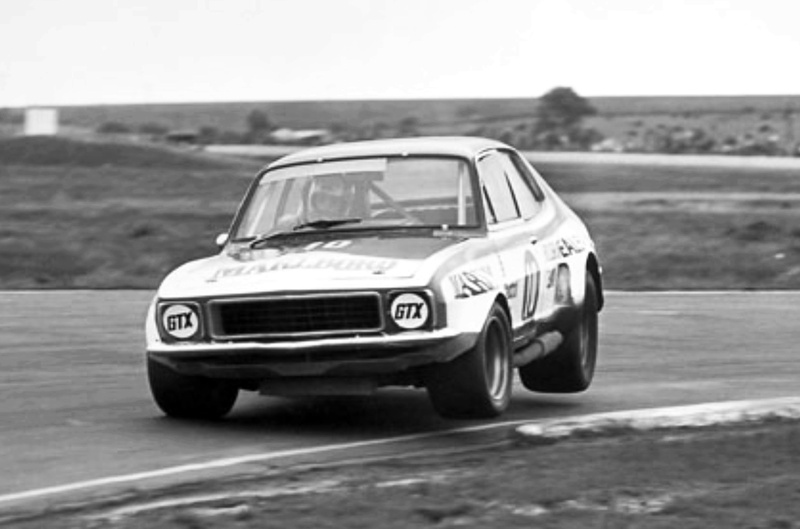 Spencer had been retired for a year or so when he took a call from new Holden Dealer Team team manager Harry Firth to share a Monaro with KB during the HDT’s first event, the 1969 Sandown Datsun 3 Hour. 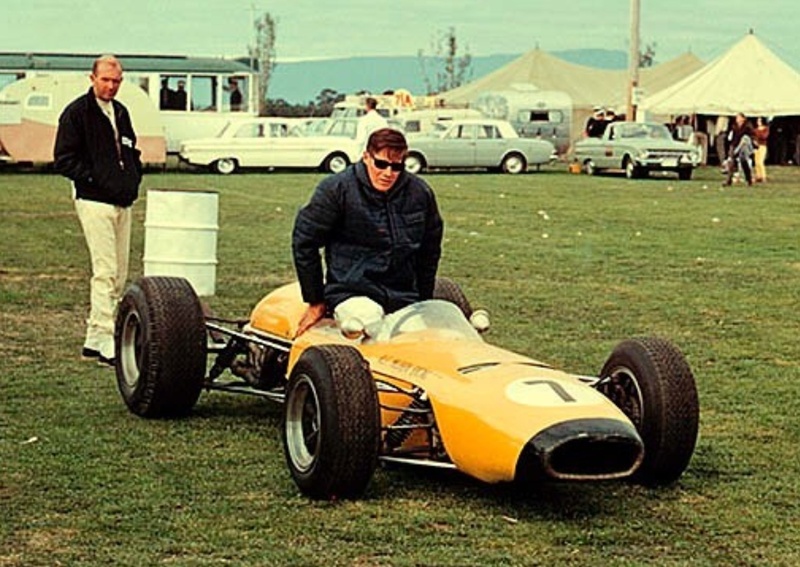 Ex-Ford racer/engineer/team manager, now Holden new boy Harry Firth was prevailed upon to hire a couple of single-seater drivers to race his new toy, Firth more of a believer in taxi drivers racing taxis, so to speak. 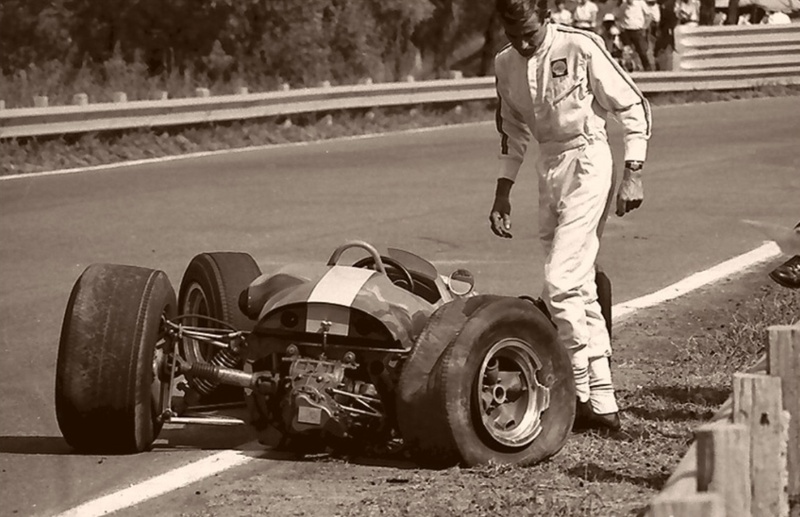 In a story for another time Martin had a massive brake failure at about the 45 minute mark of the endurance classic at the end of Sandown’s main straight, he skilfully backed the car into the Shell Corner armco minimising the damage to his good self but the car caught fire. 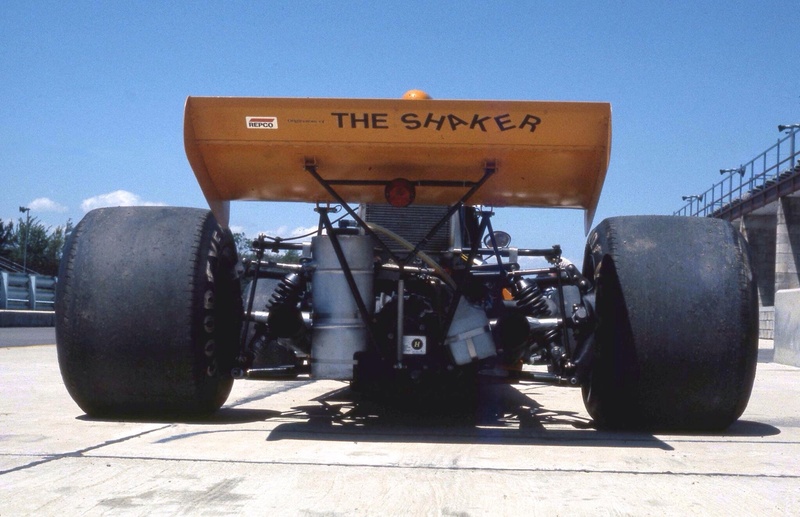 The accident is variously attributed to boiled fluid, ‘brake booster system’ or standard brake pads being mistakenly fitted to the car prior to the race. 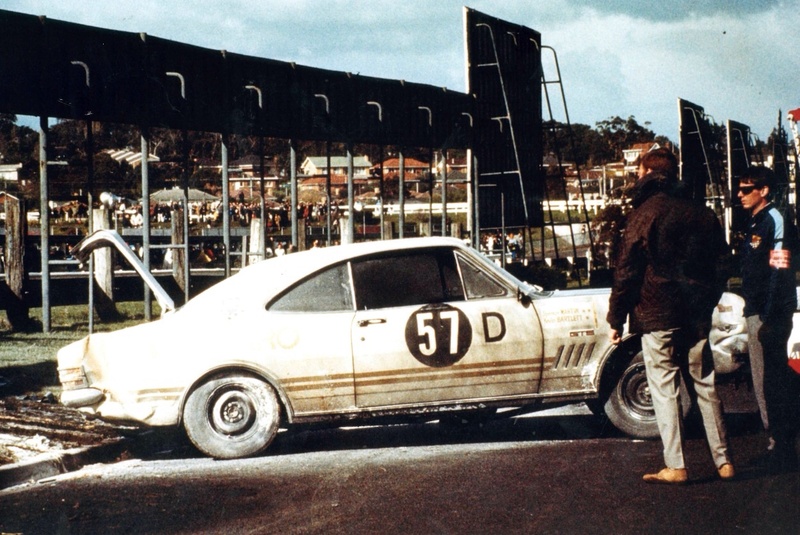 The Monaro was repaired after the race and sold by tender, it still exists. Spencer retired from a meeting he only entered after agreement with his new wife that a race in a touring car was relatively safe! 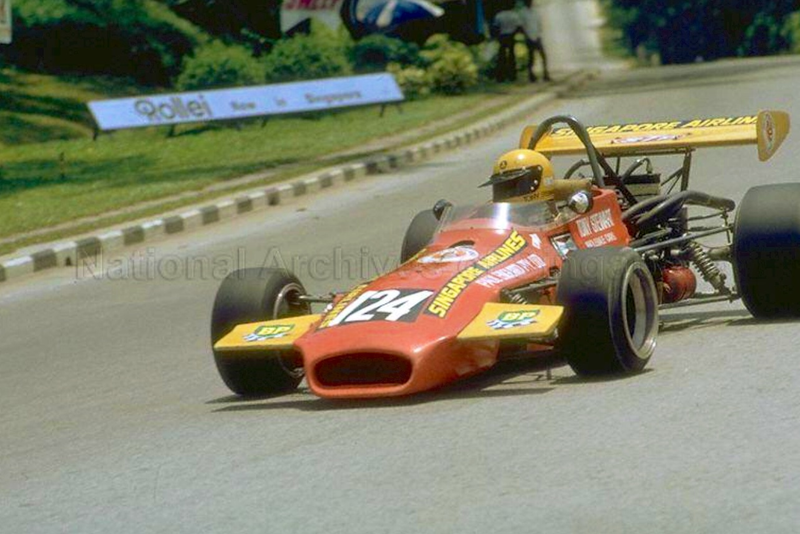 His comeback to racing in the historic scene was a couple of decades hence. Posted: June 6, 2016 in Fotos, Who,What,Where & When...? This short piece is inspired by these photos posted on social media for the first time this month. 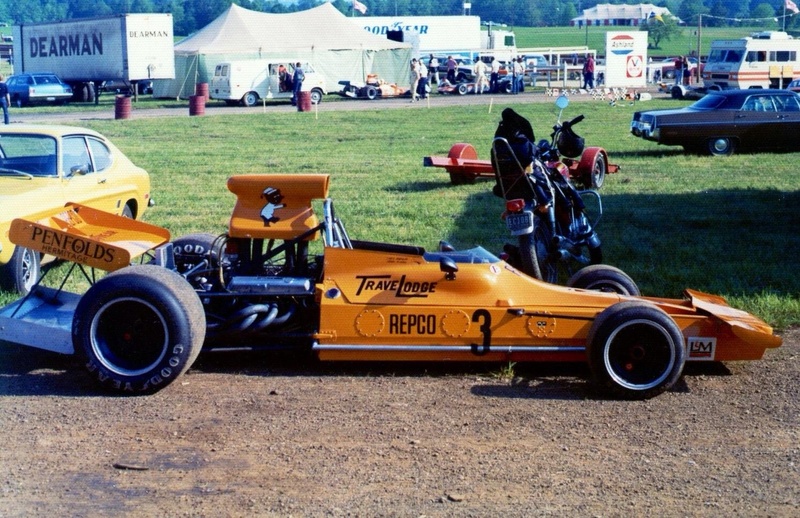 They are ‘mouth-watering’ for me as i’ve always loved this car especially in its Matich original ‘mellow yellow’ Repco livery. Its just the nicest, oh-so-fast bit of beautifully integrated kit. 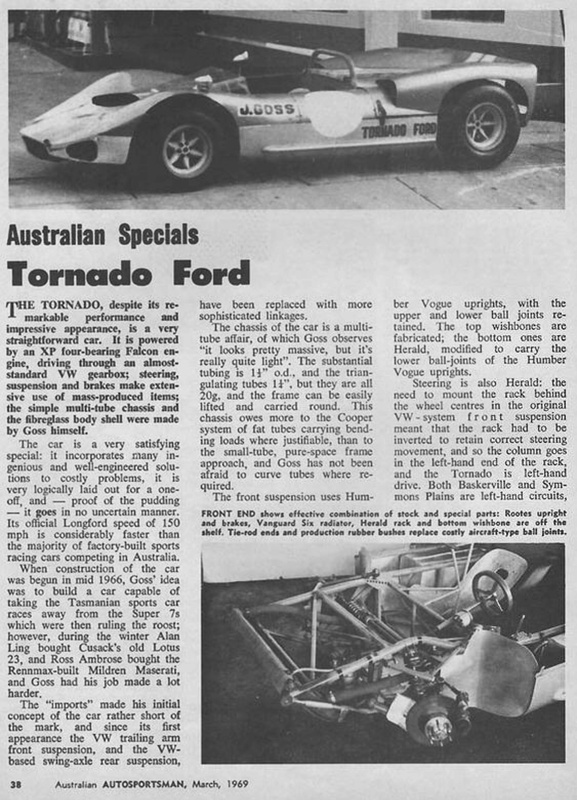 To have seen FM race it in the US L&M Series in ’74 would have been really something, A53 showed it could run and beat the best of the Lola T330/2’s in Goss’ hands in Oz. Frank would definitely have given a few folks some curry with all of the teams learnings from its unsuccessful 1973 American campaign. 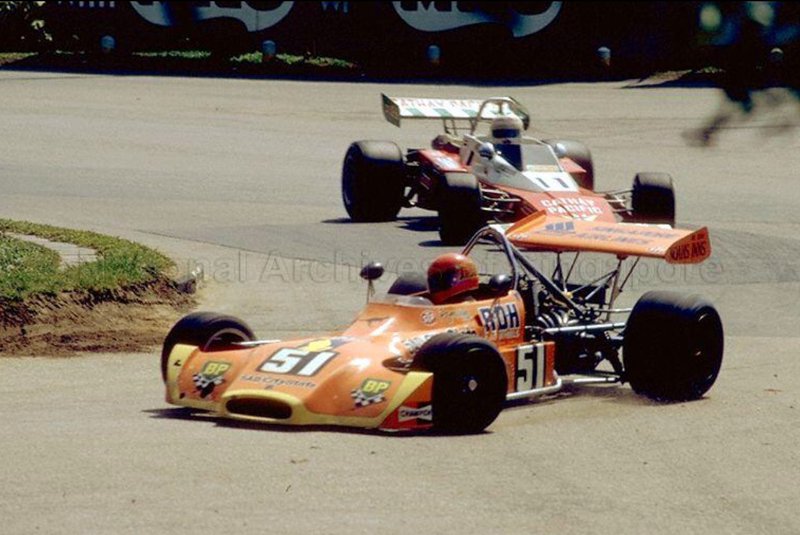 In F5000 Gossy was ‘on it’ from the start, giving the established aces plenty he was as ‘quick as his mouth’, legend that he was for saying so little in so many, many words!